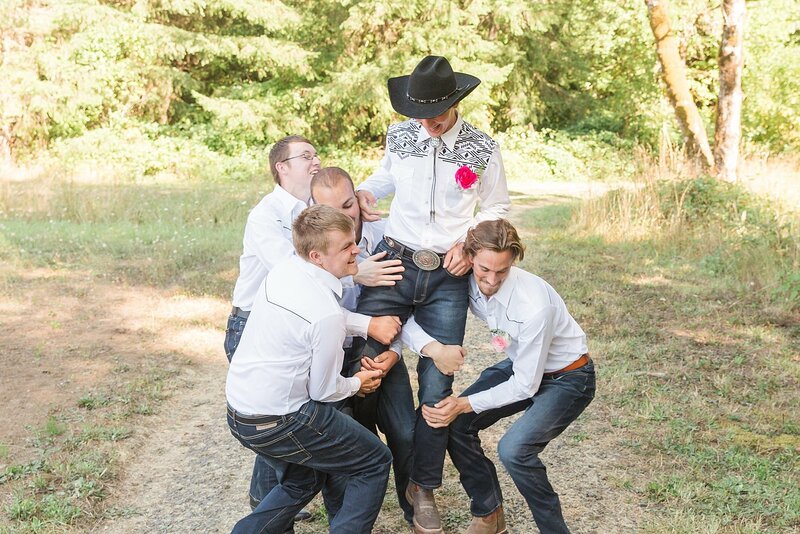 Where do I even begin with this wedding? 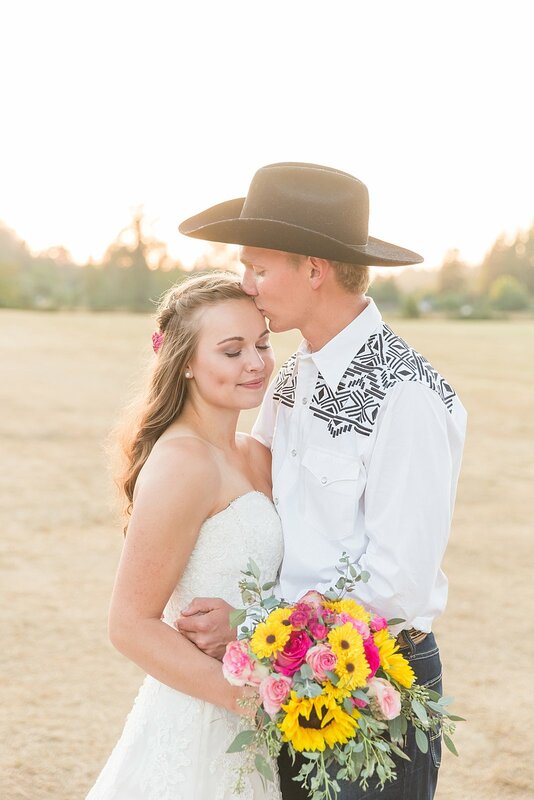 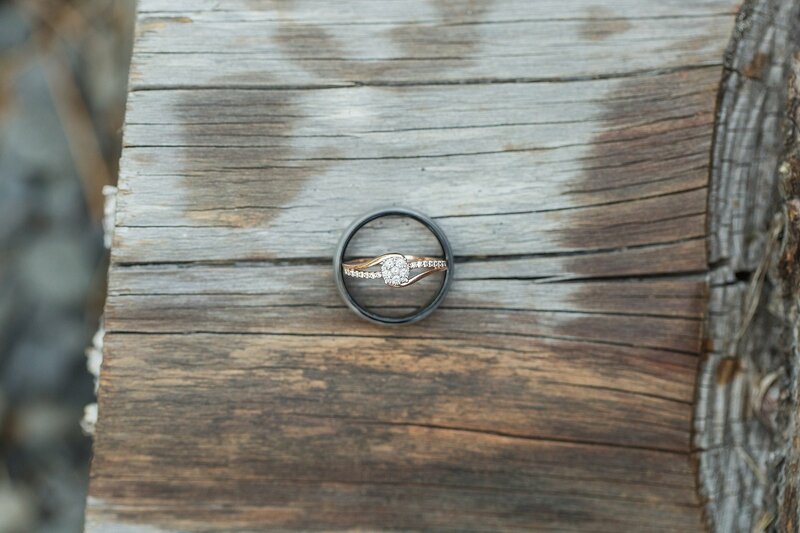 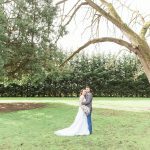 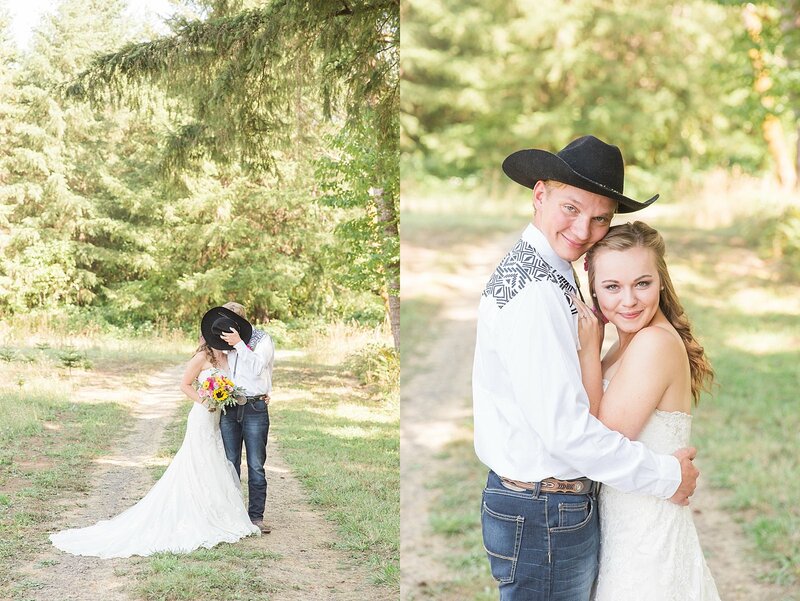 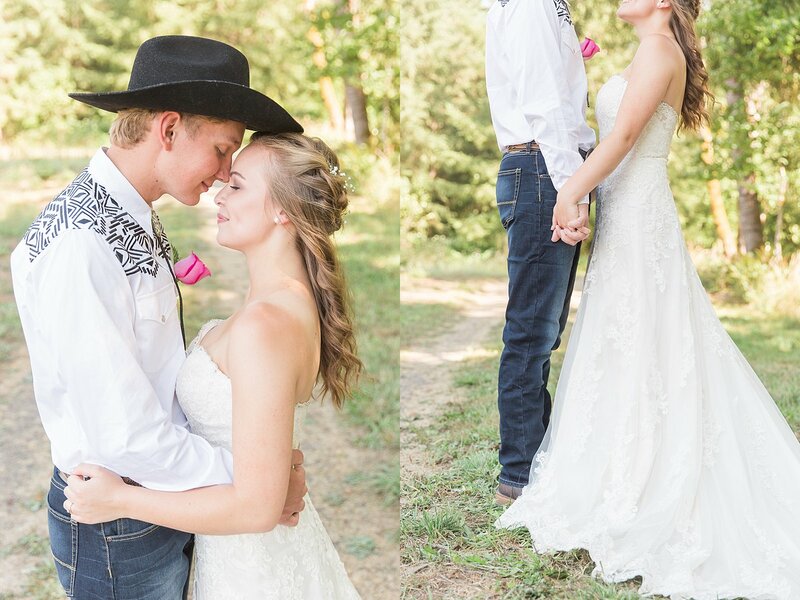 Being able to capture a new marriage starting out is amazing in and of itself, but being able to capture that day for someone you know is even more amazing! 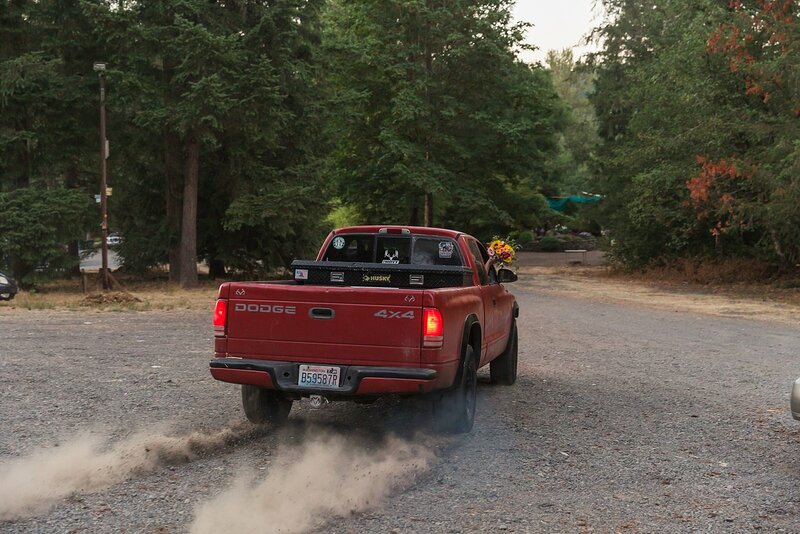 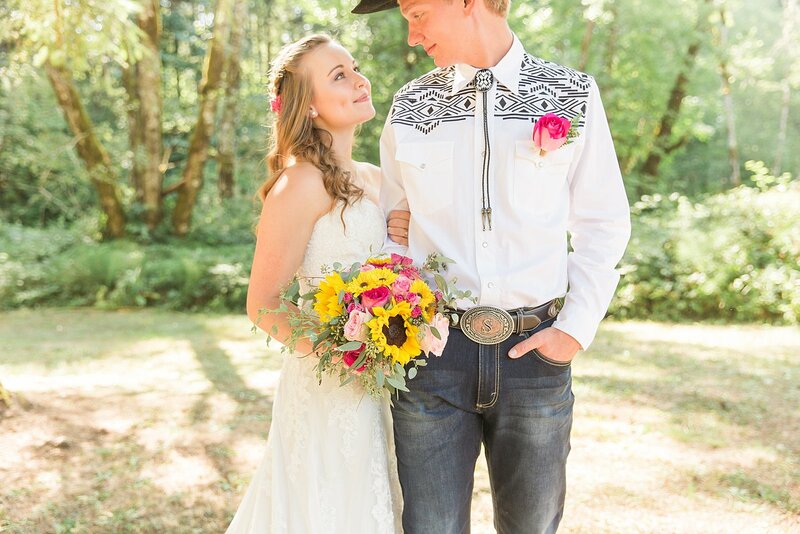 I’ve known Madalyn for a couple years, and my man has known her for even longer through Search and Rescue. 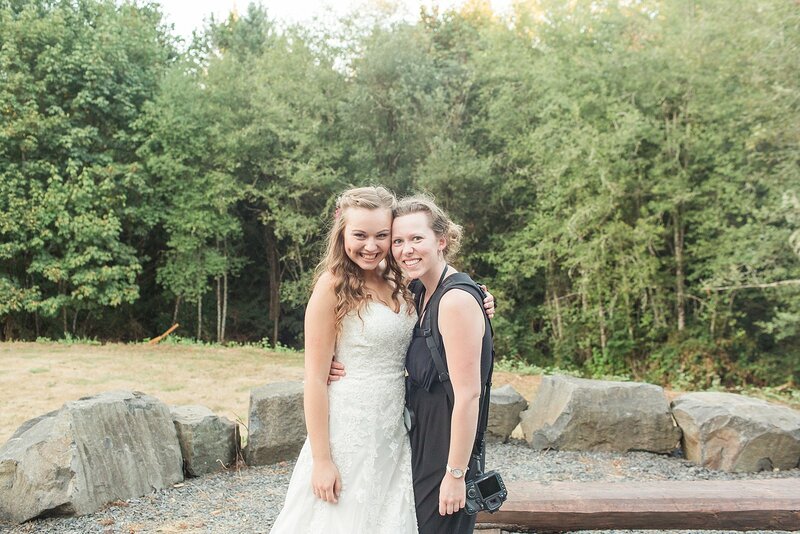 The woman has so much strength and grace, and I am so thankful to call her my friend! 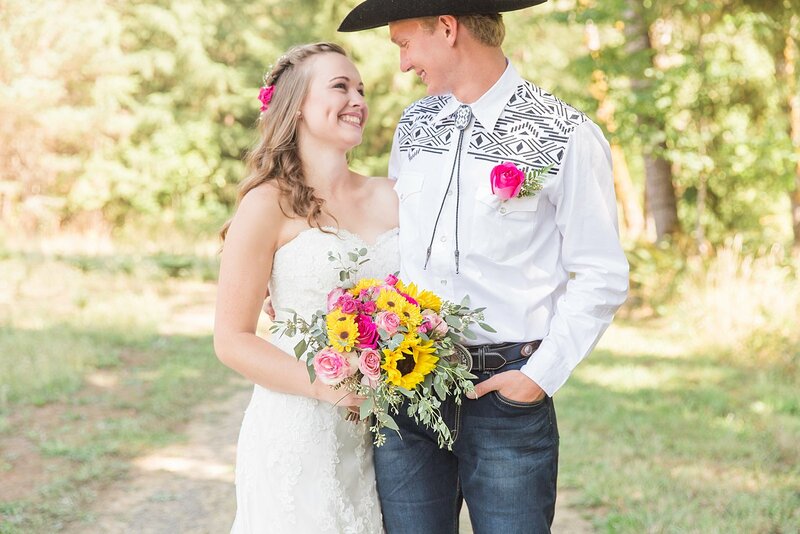 I don’t know her new hubby much at all, but from everything I saw on their wedding day, he’s definitely the perfect fit for her. 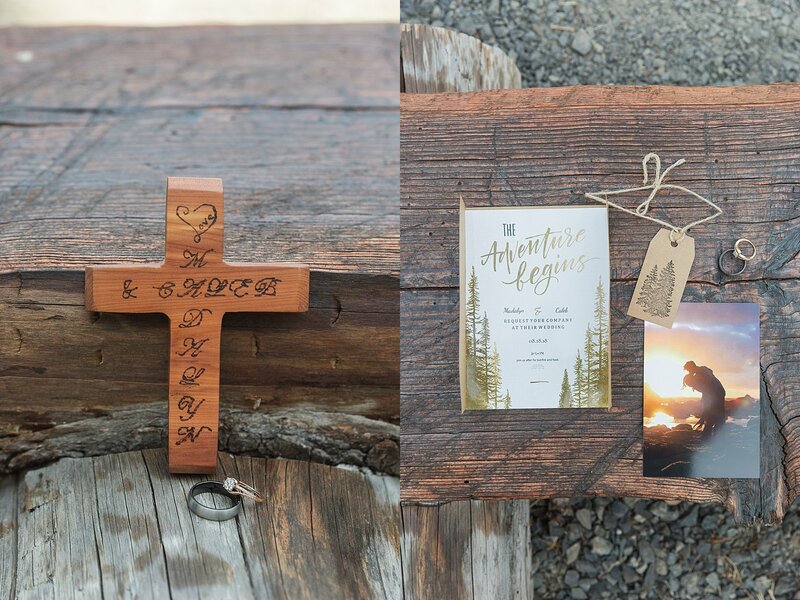 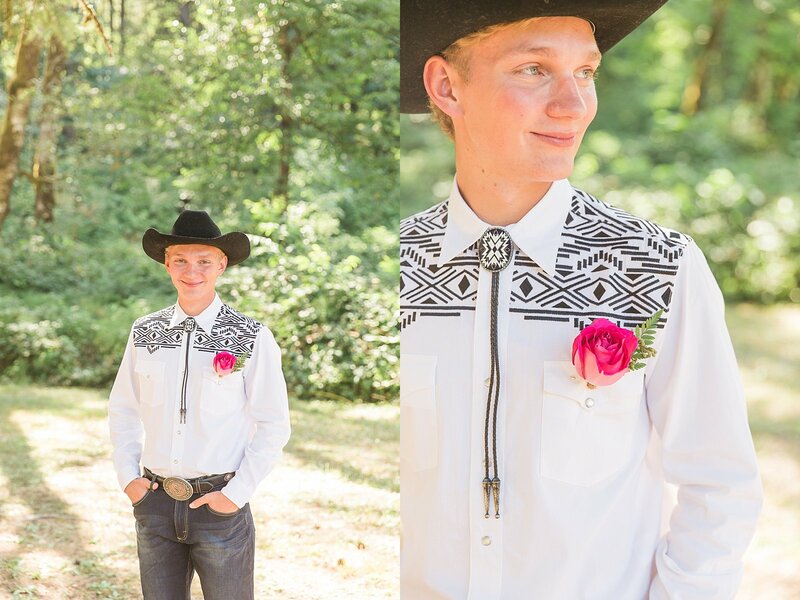 Caleb + Madalyn’s big day started with Dutch Bros coffee (of course) and photographing some of the Bride’s beautiful details, including a wooden cross that Caleb had made for her when they first started dating. 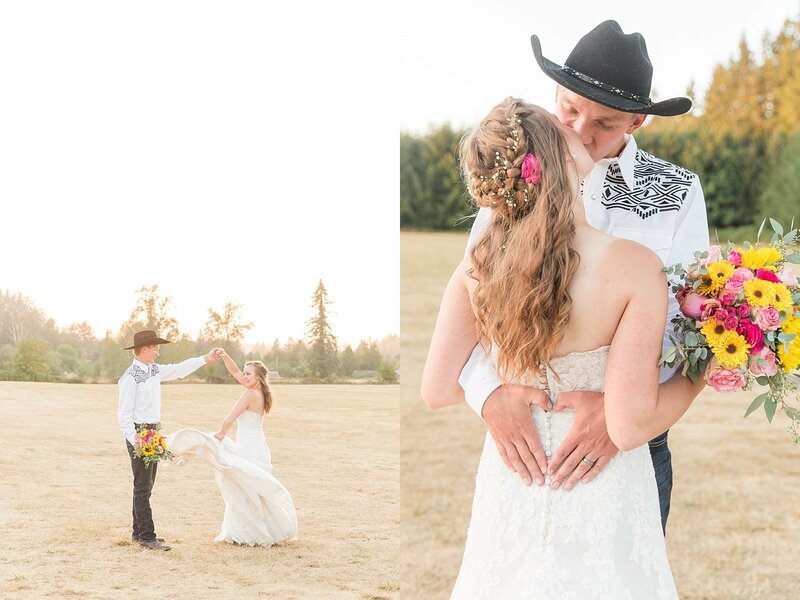 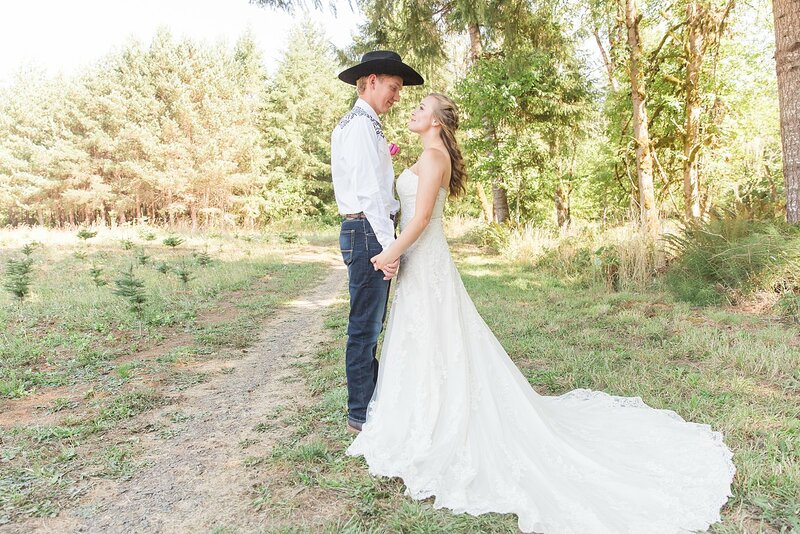 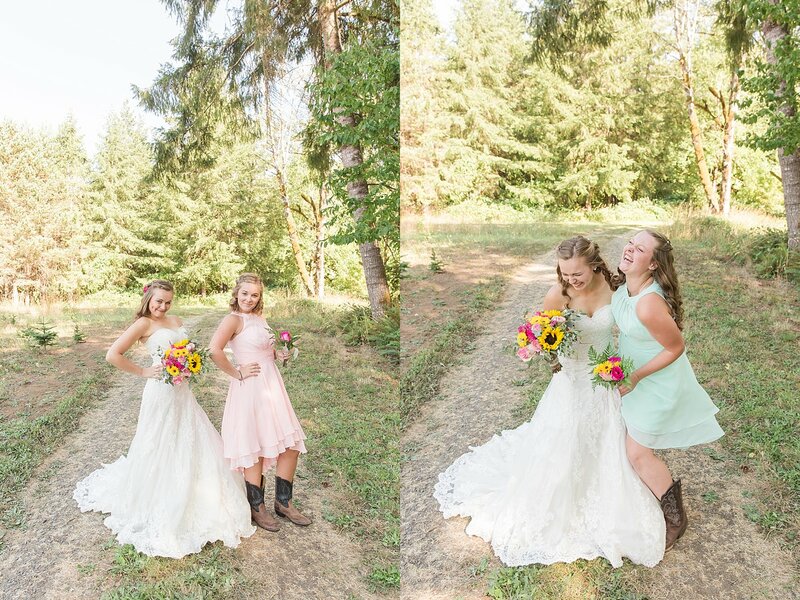 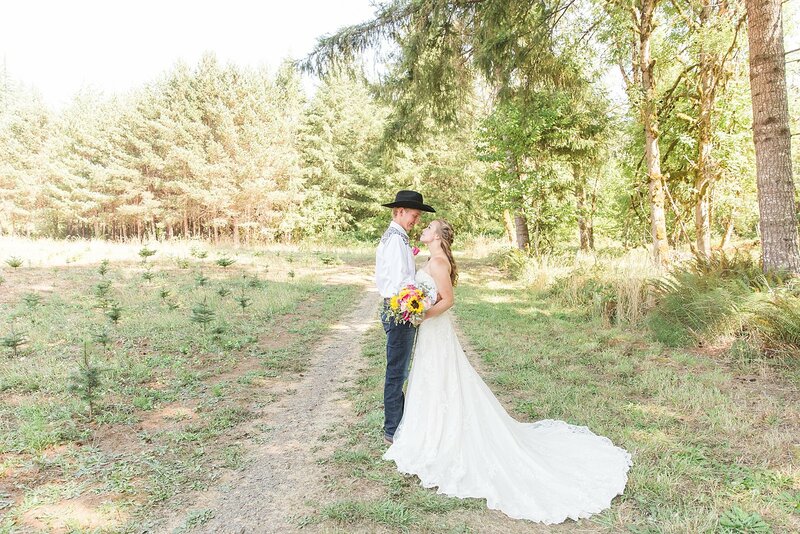 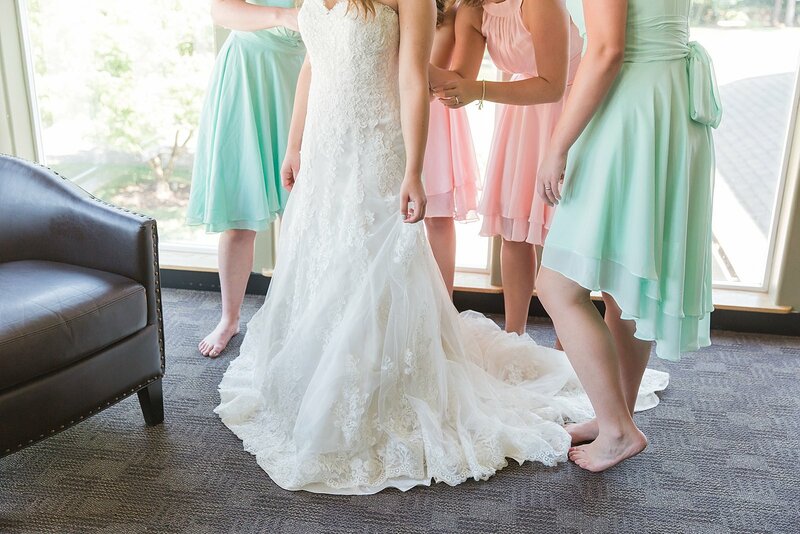 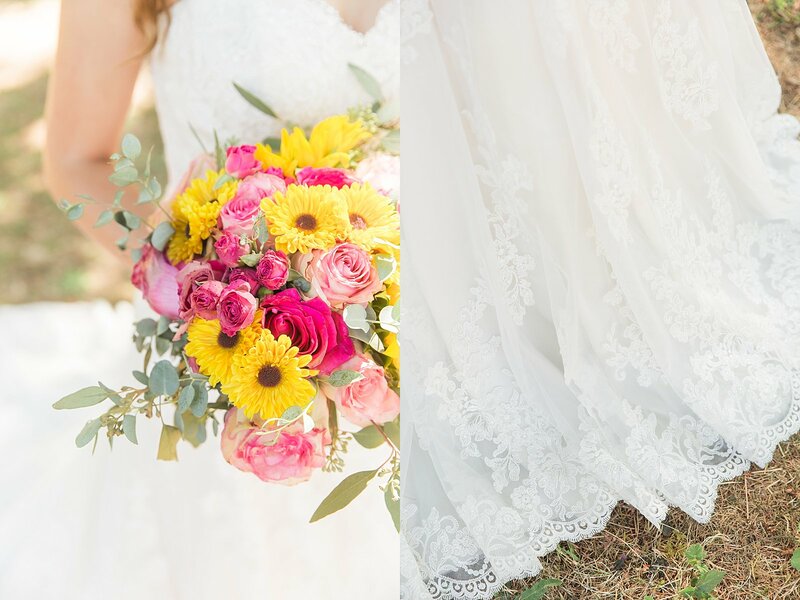 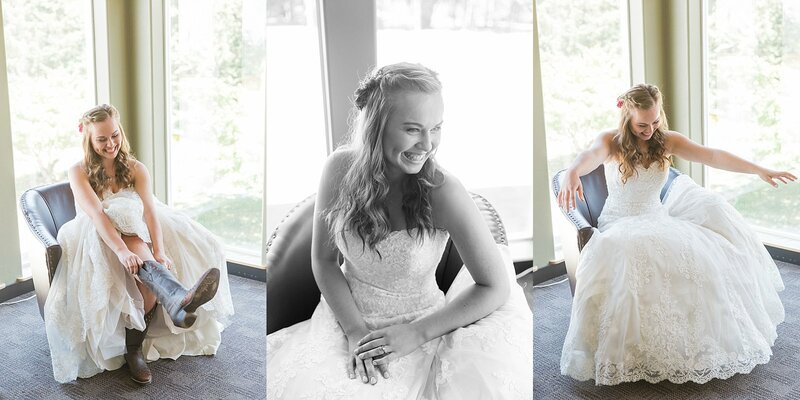 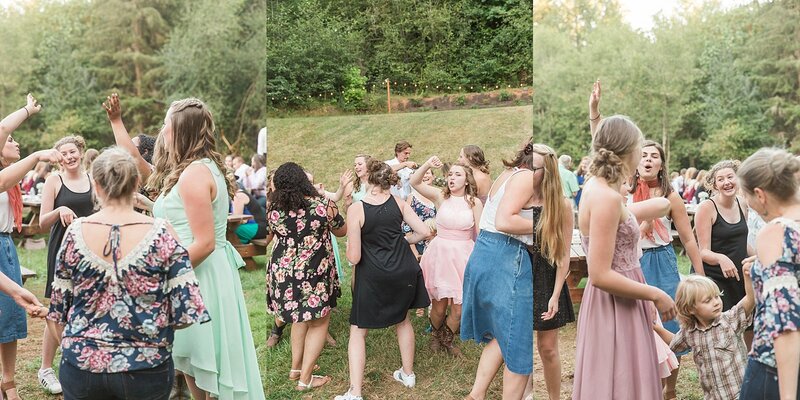 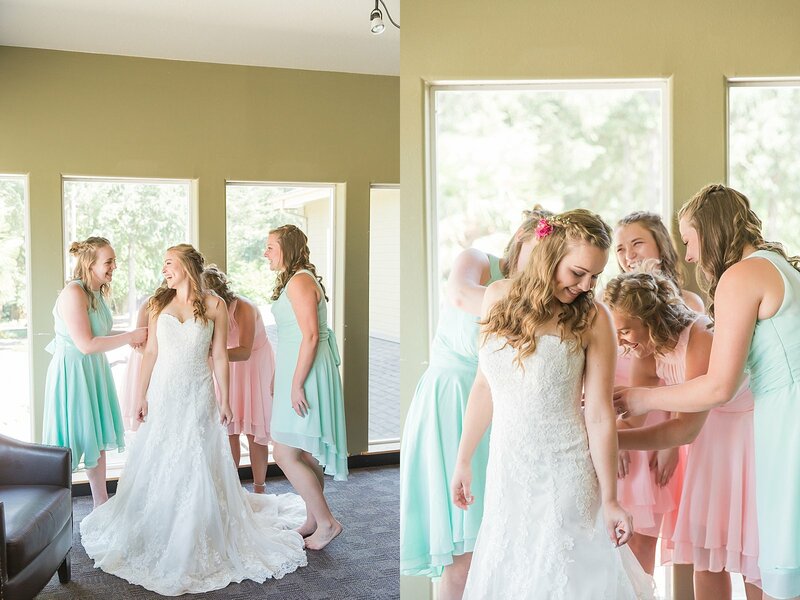 One of my favorite part of any wedding day is seeing the Bride’s dress for the first time, and Madalyn’s twirl worthy gown definitely did not disappoint! 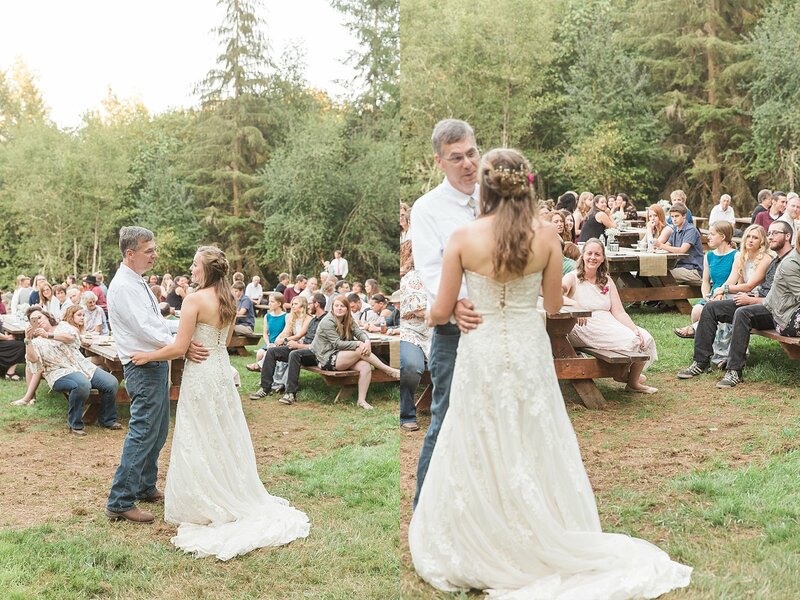 (Scroll down the page to see the twirls I’m talking about.) 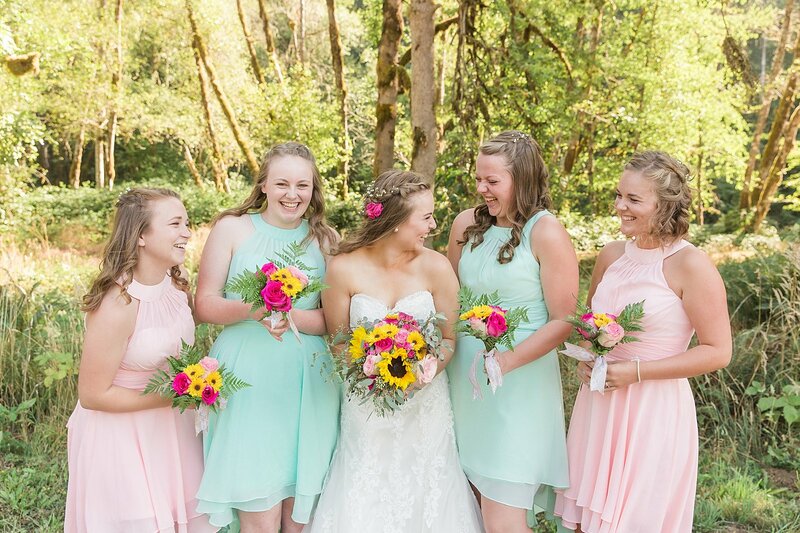 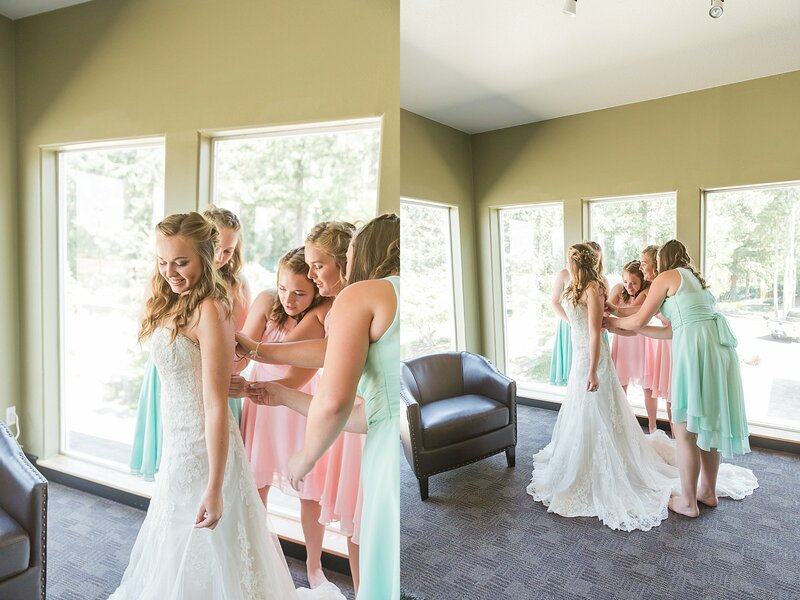 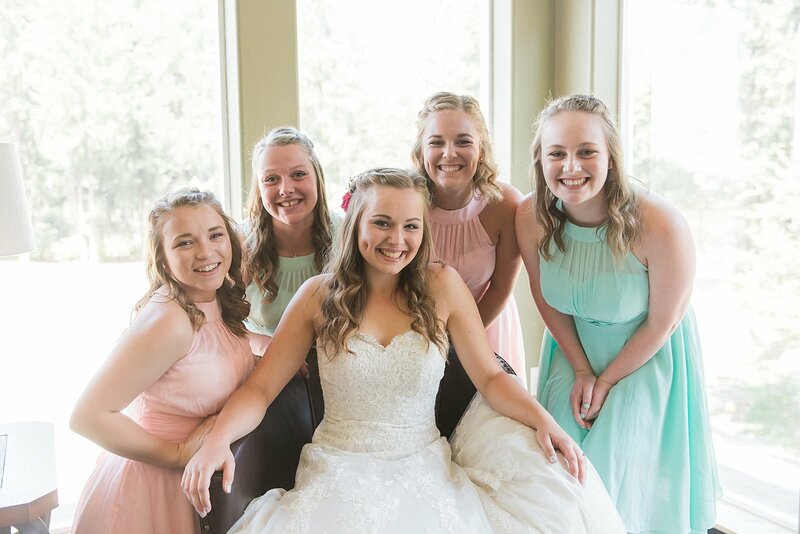 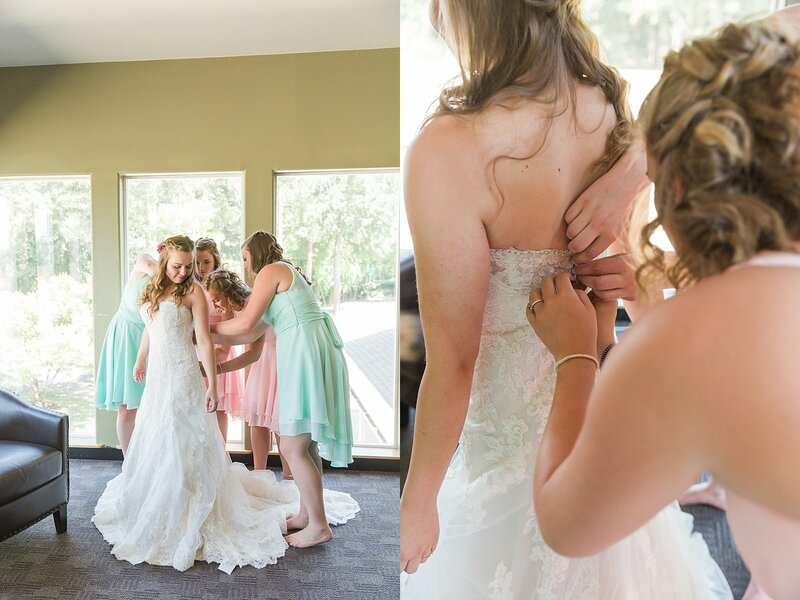 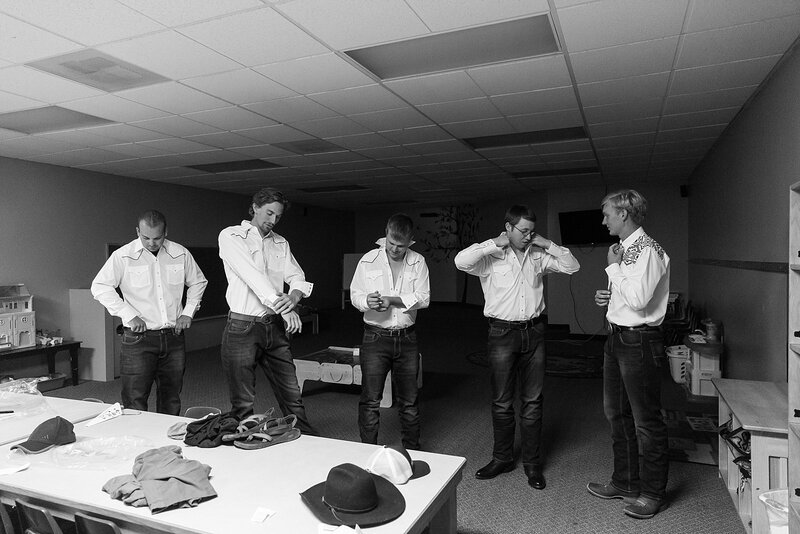 Madalyn’s bridesmaids helped her get ready amidst lots of laughter, and then prayed over their friend before we headed out for the first look. 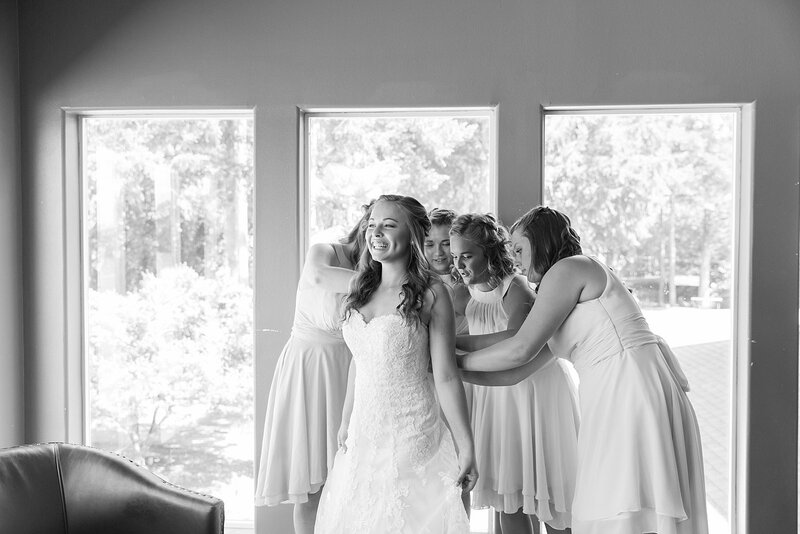 Bridal party portraits followed the first look/Bride + Groom portraits, and while I could go on and on about what a fun group the bridal party was, and how the way that they so easily laughed and interacted with each other made my photographer heart so happy, I think I will just let the photos speak for themselves! 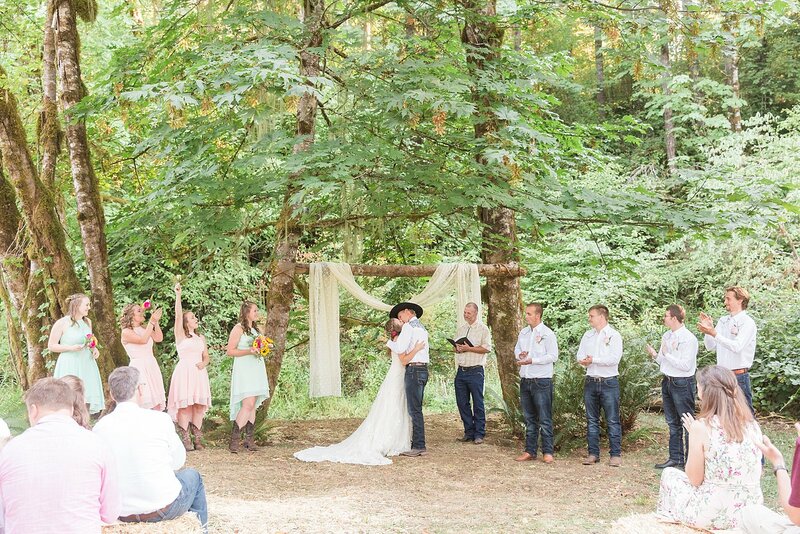 Before we knew it, it was time for the ceremony. 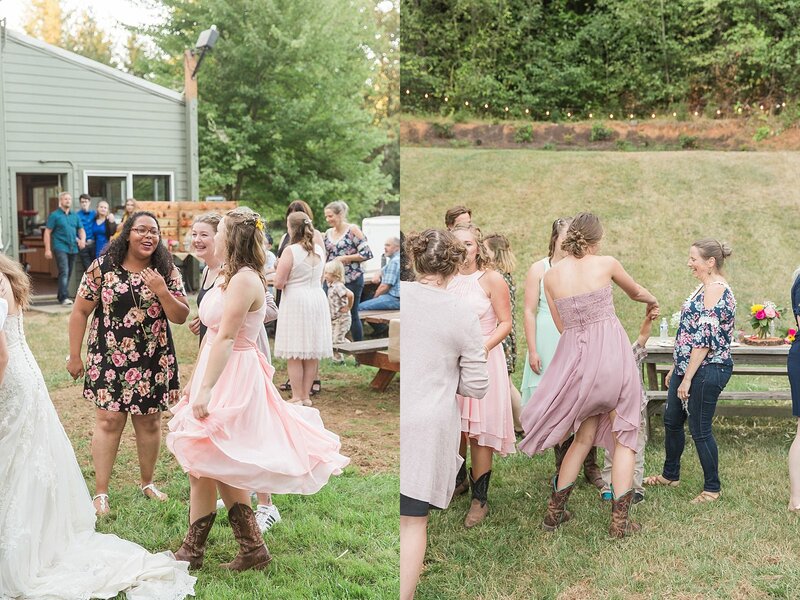 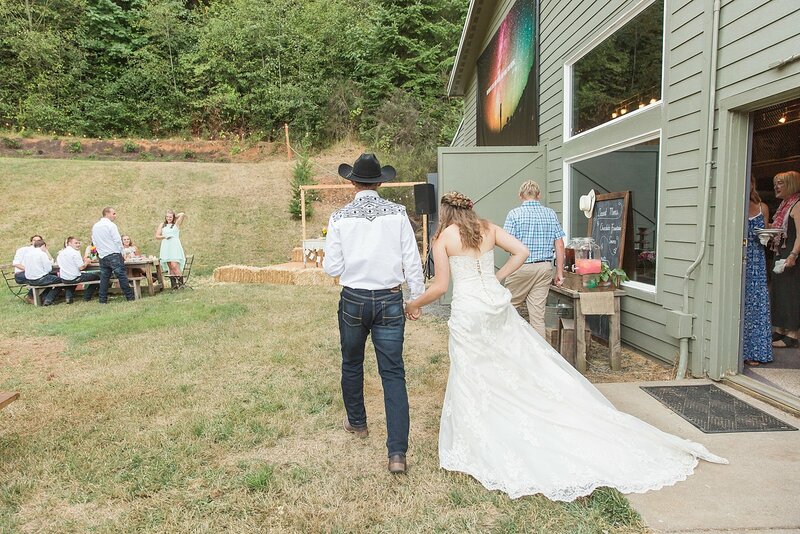 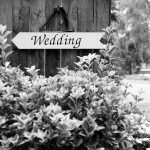 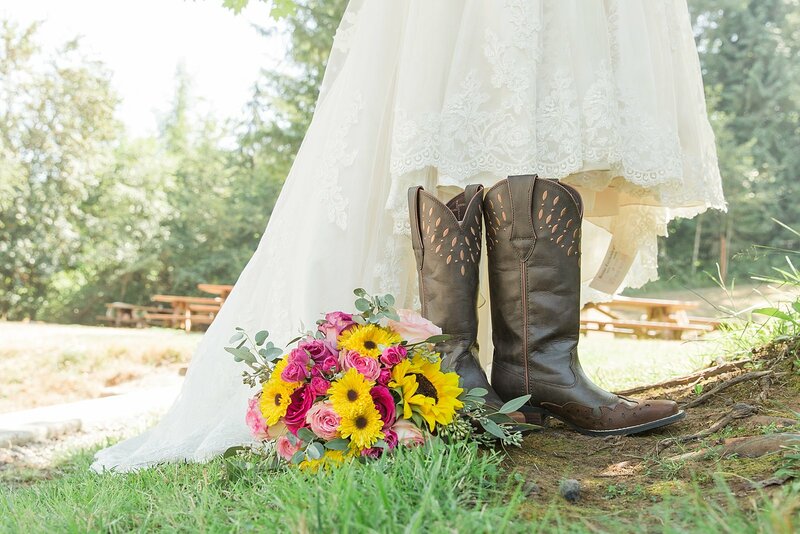 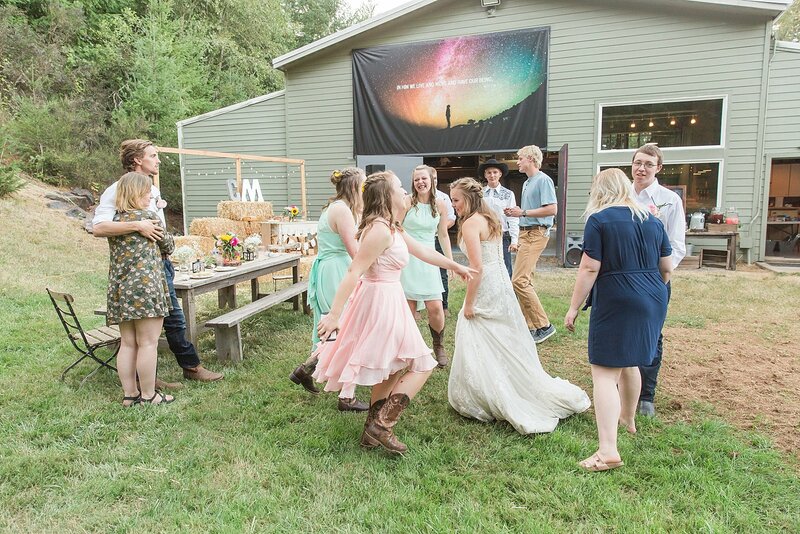 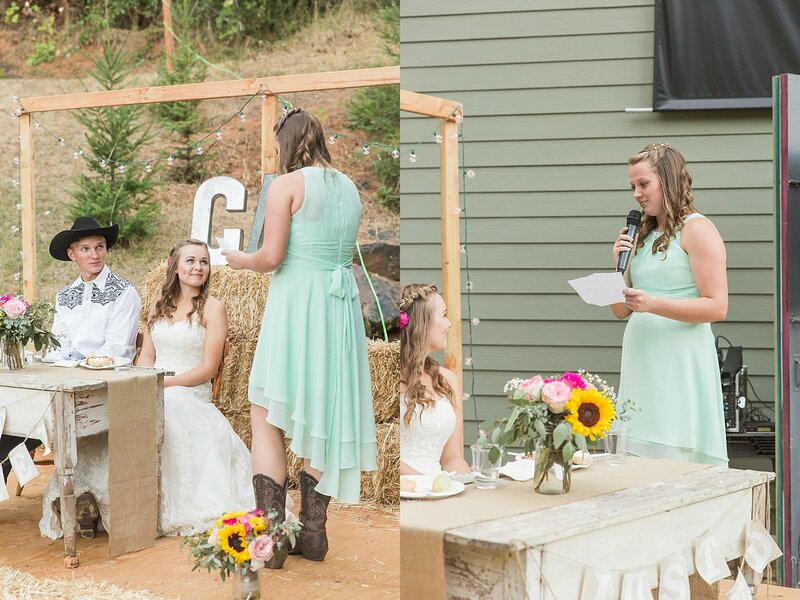 Madalyn walked down the aisle to “Jessica’s Theme” (which, if you read last week’s blog post about Jakob & Hailey’s wedding, you know is one of my favorite songs! 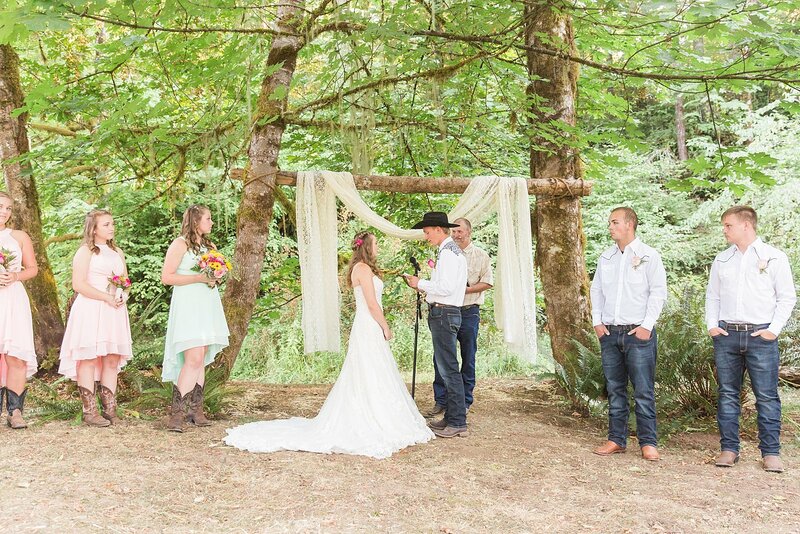 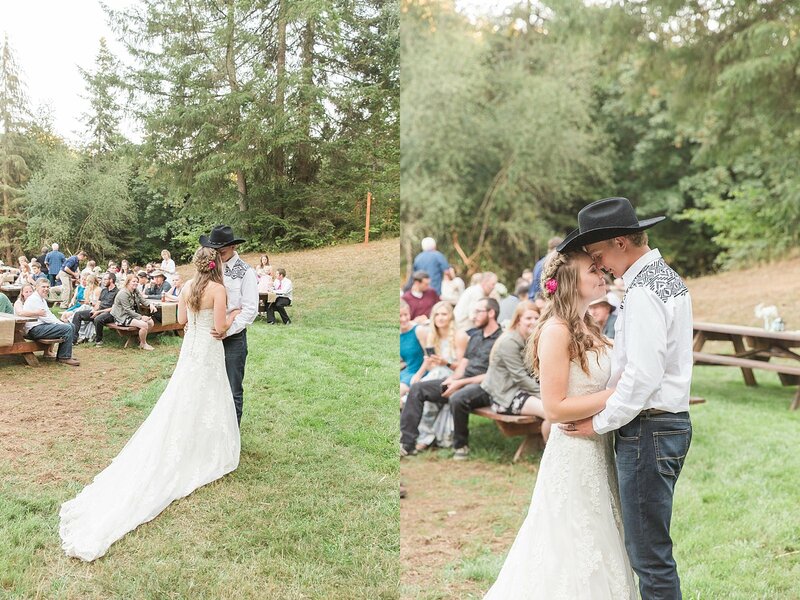 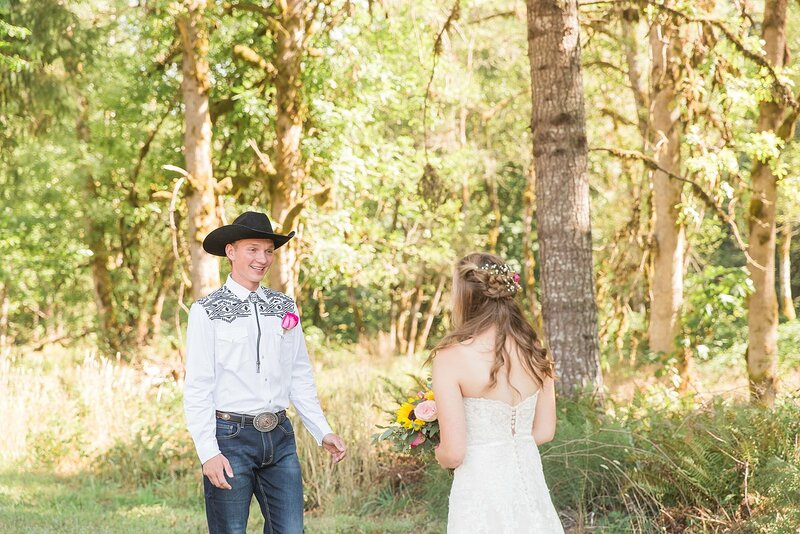 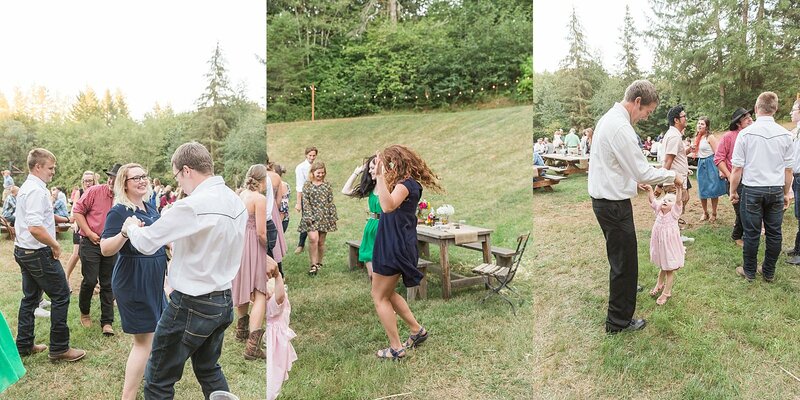 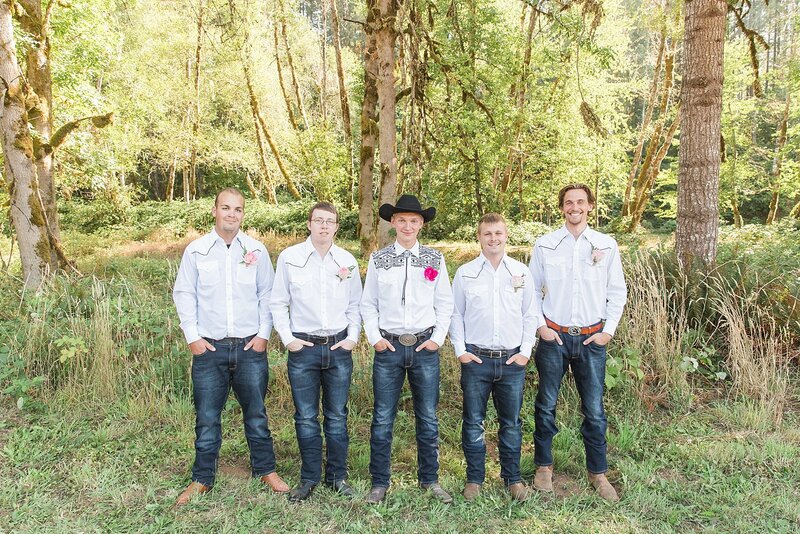 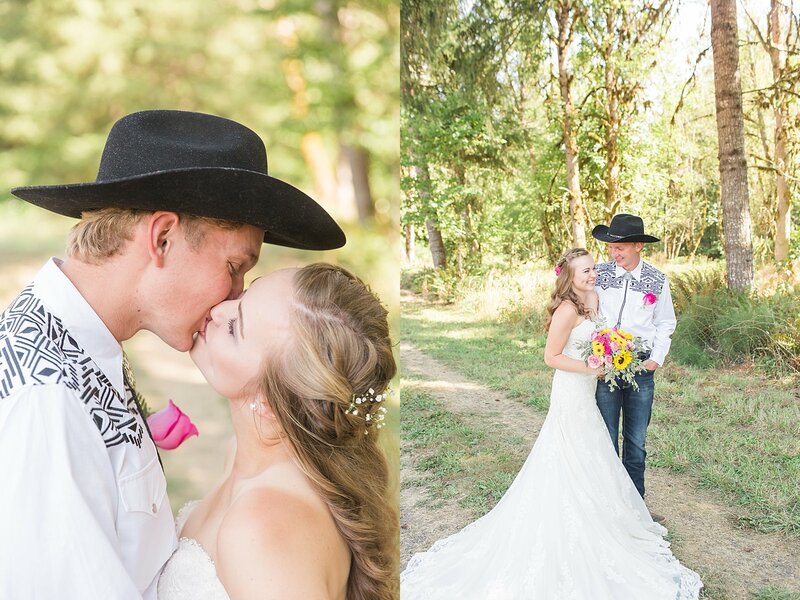 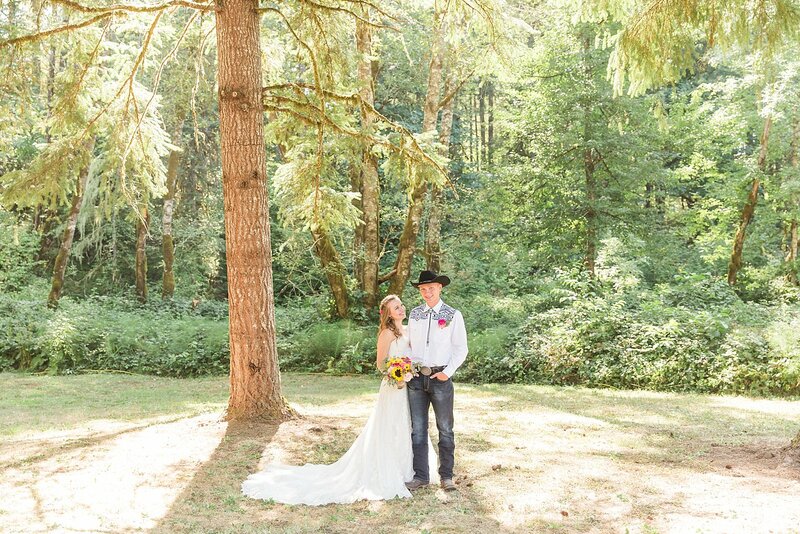 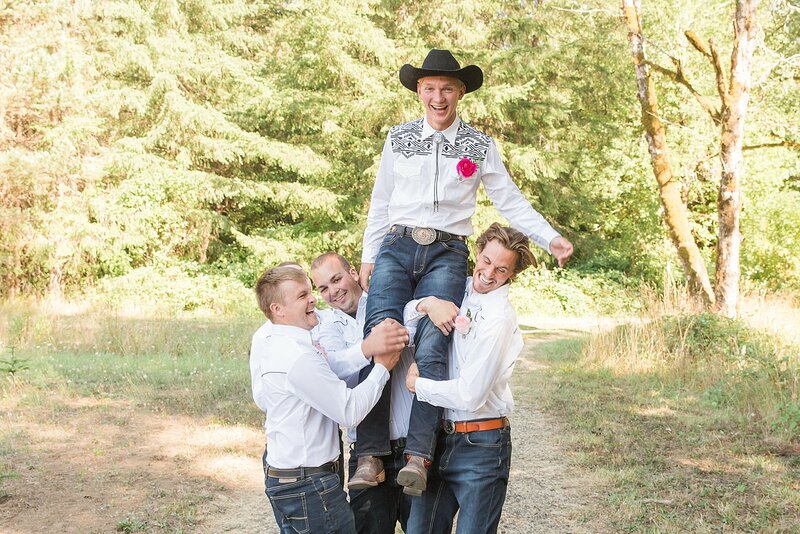 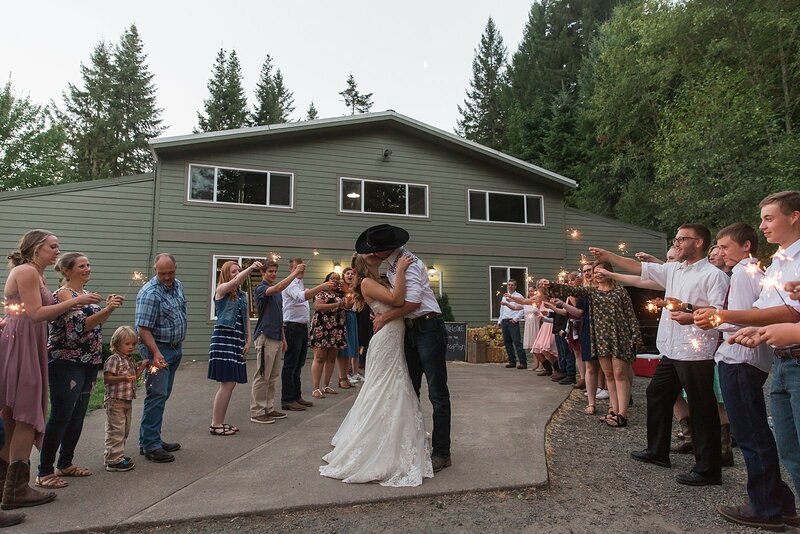 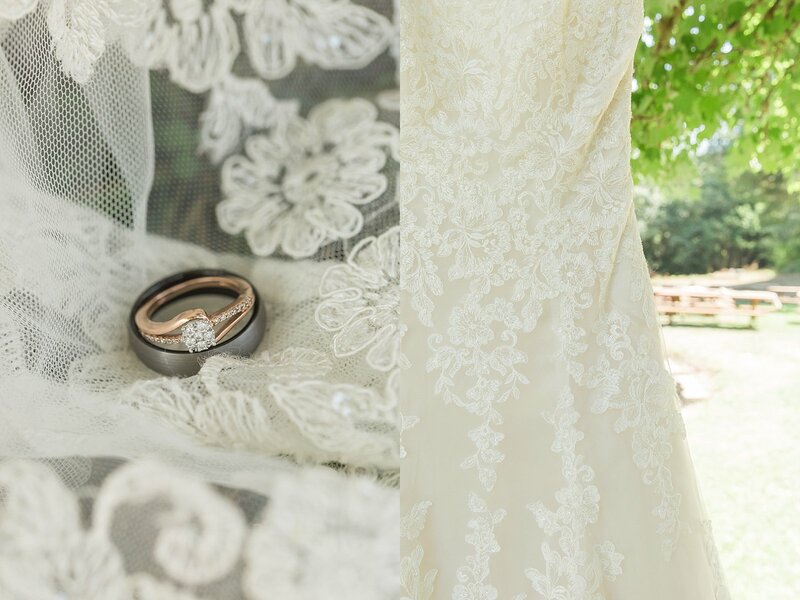 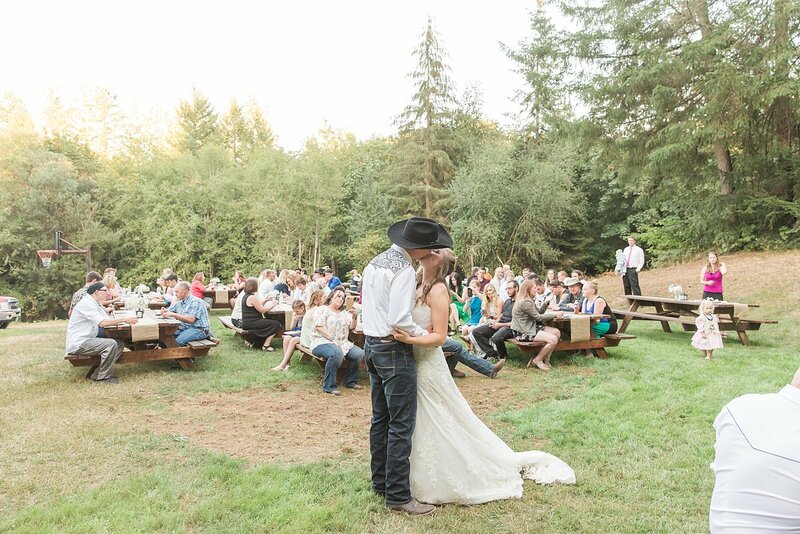 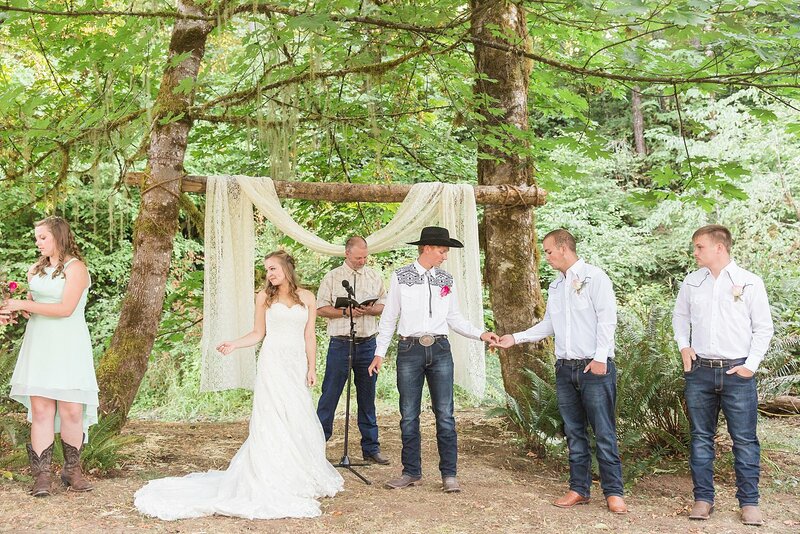 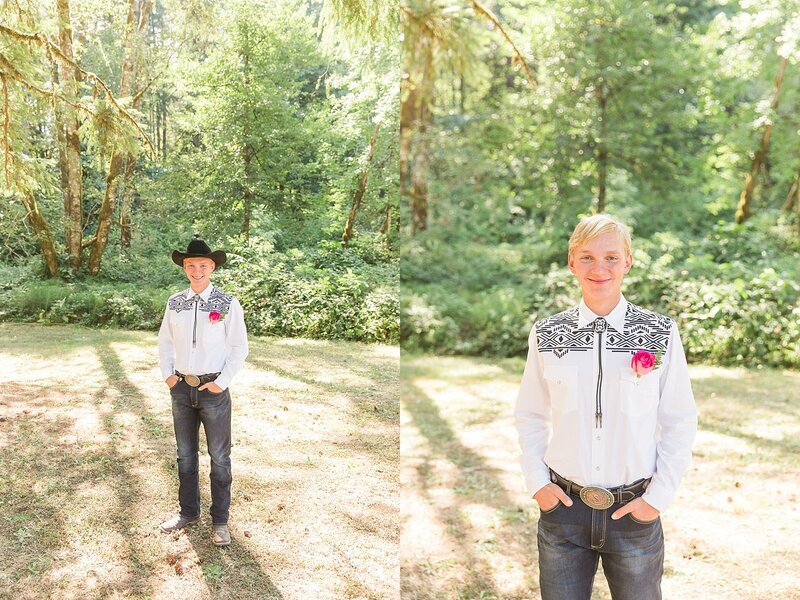 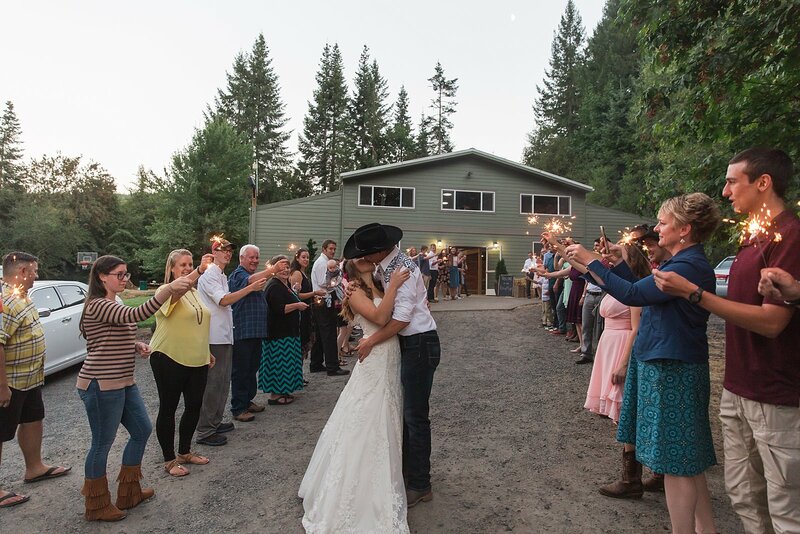 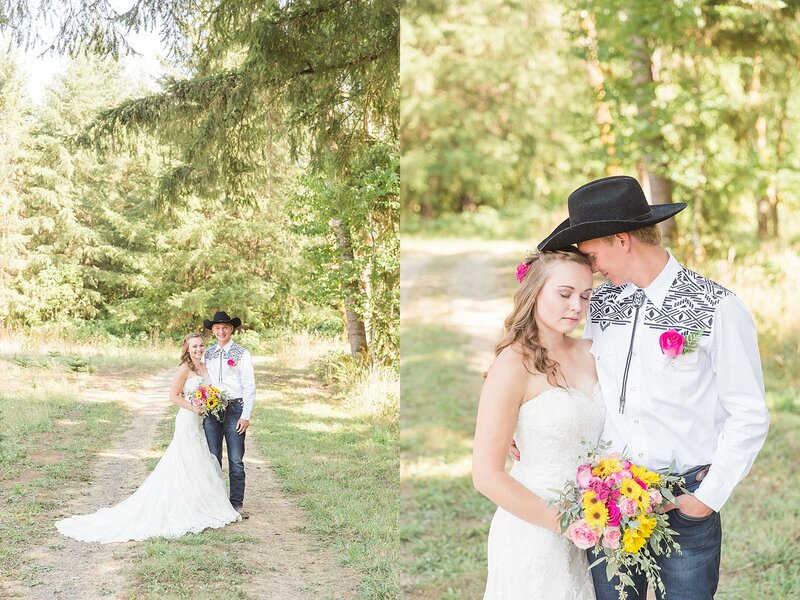 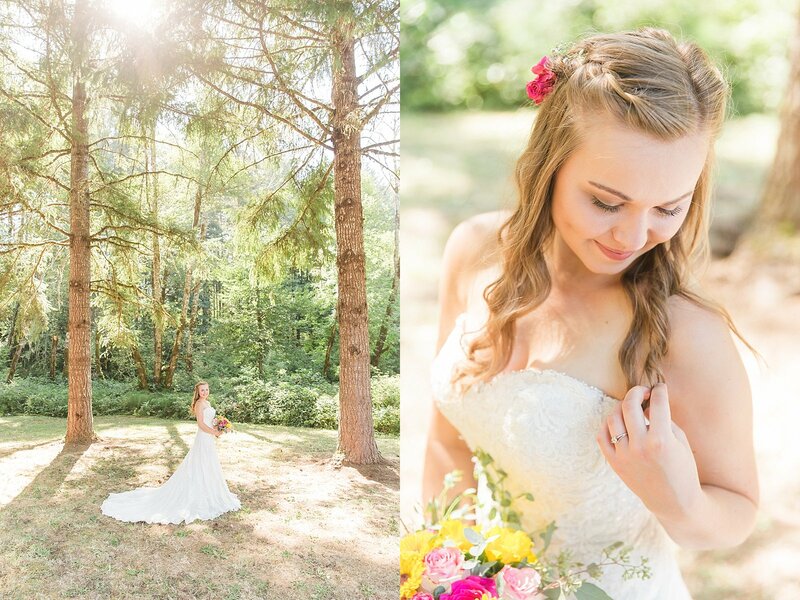 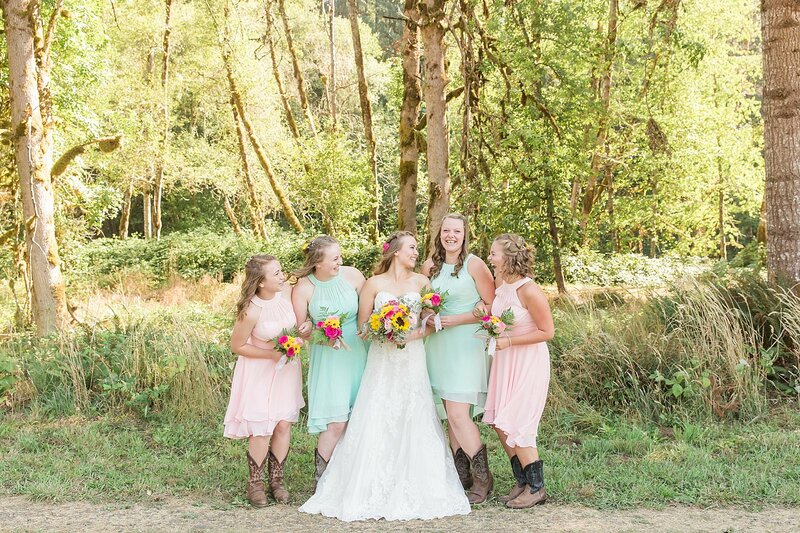 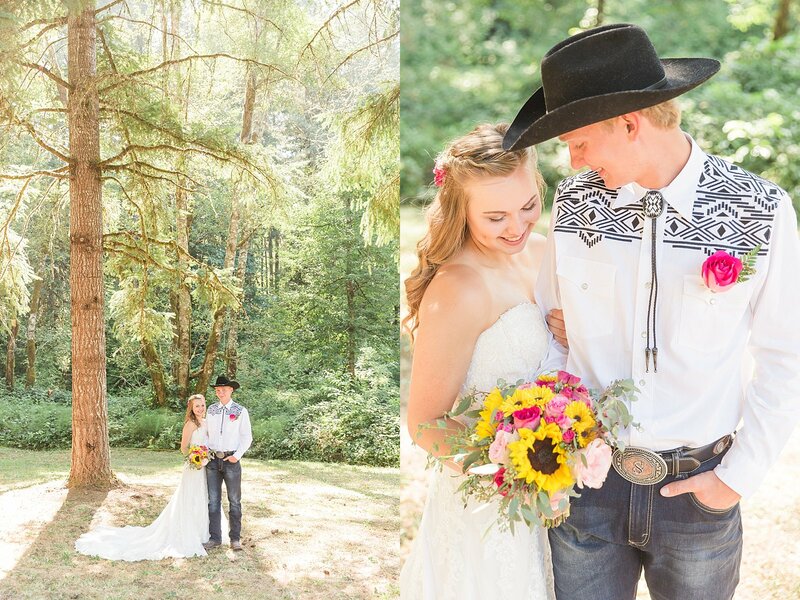 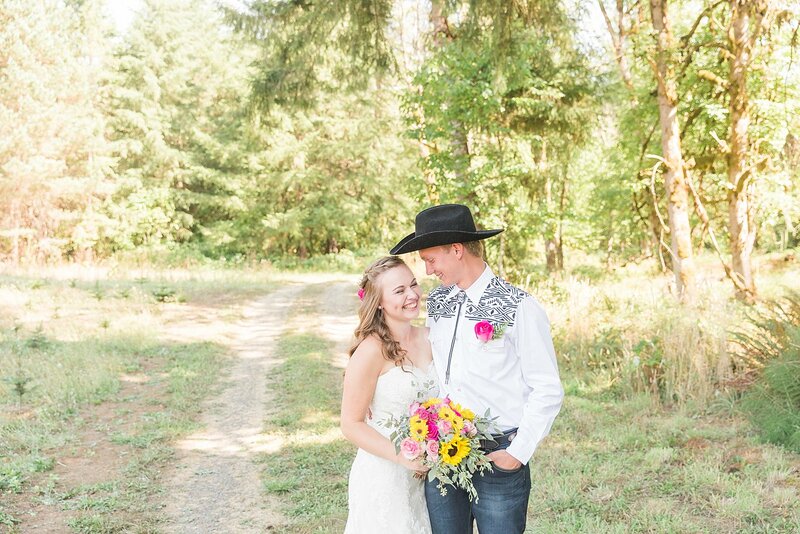 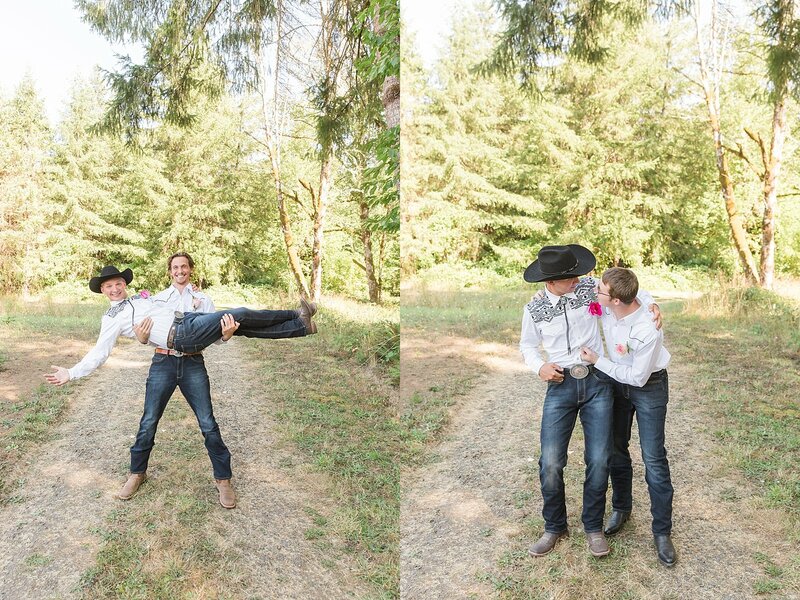 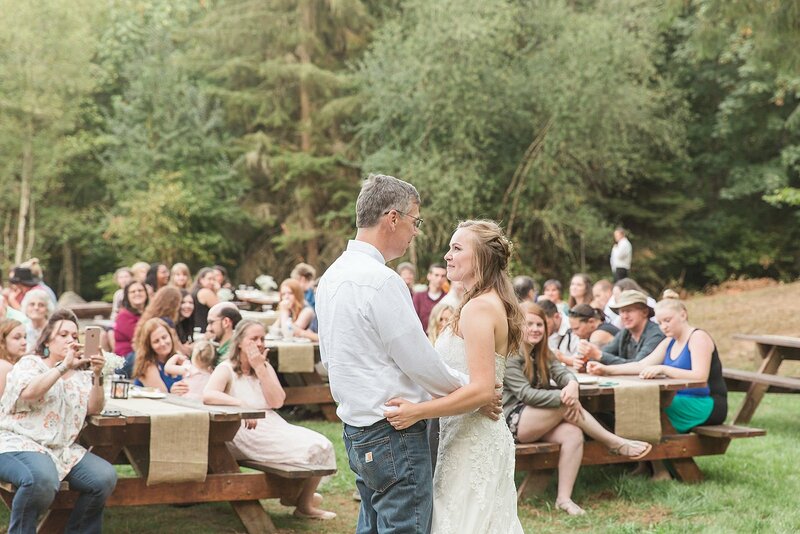 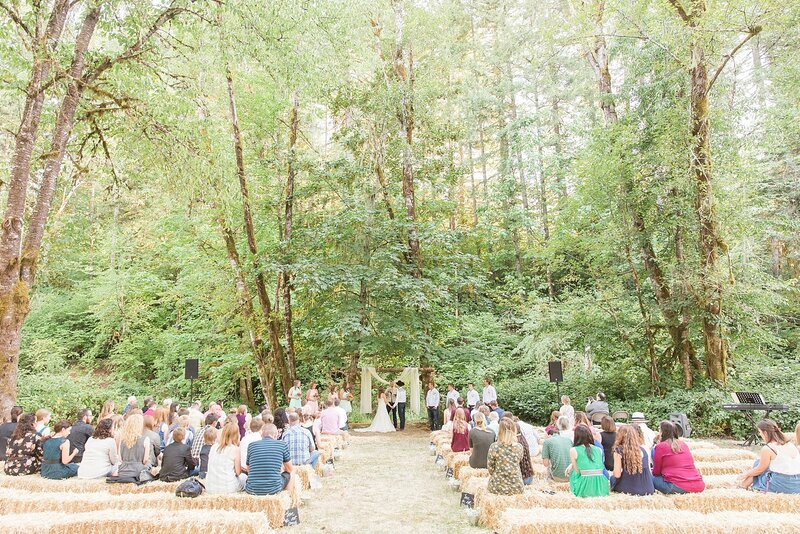 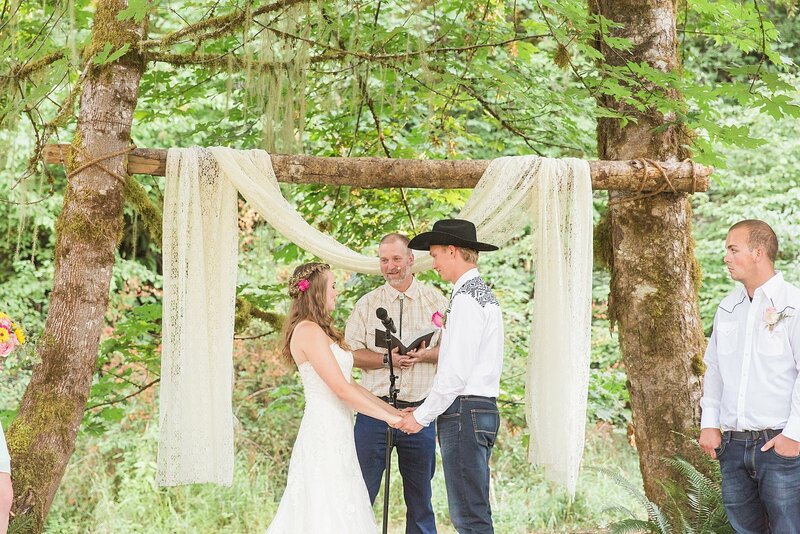 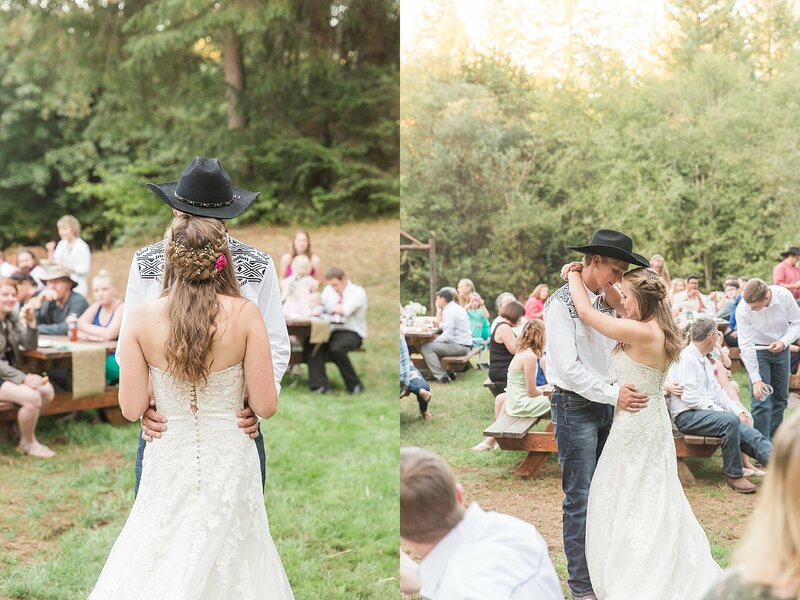 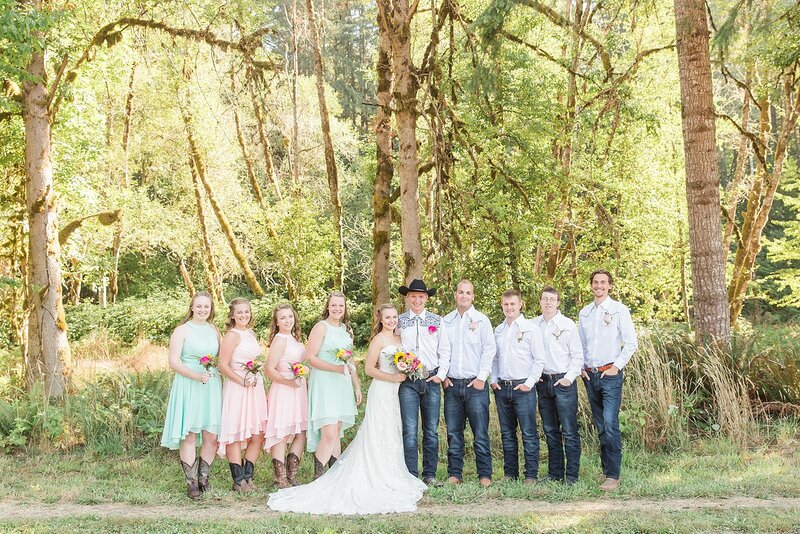 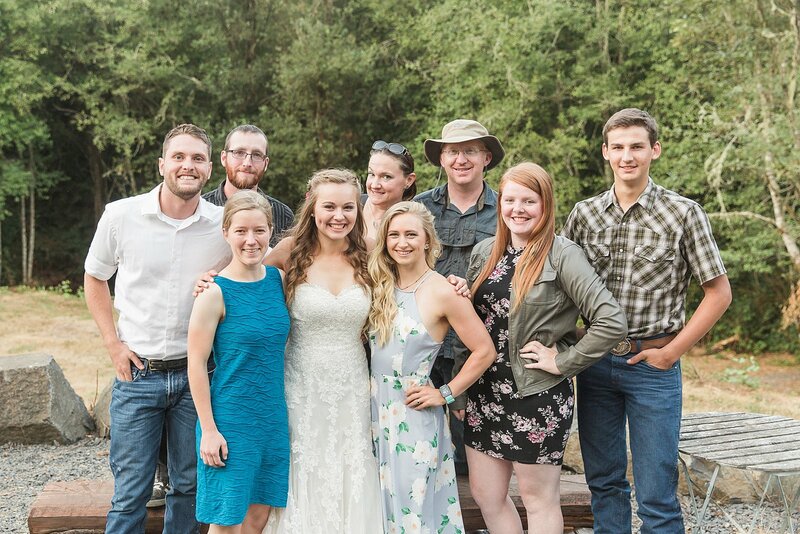 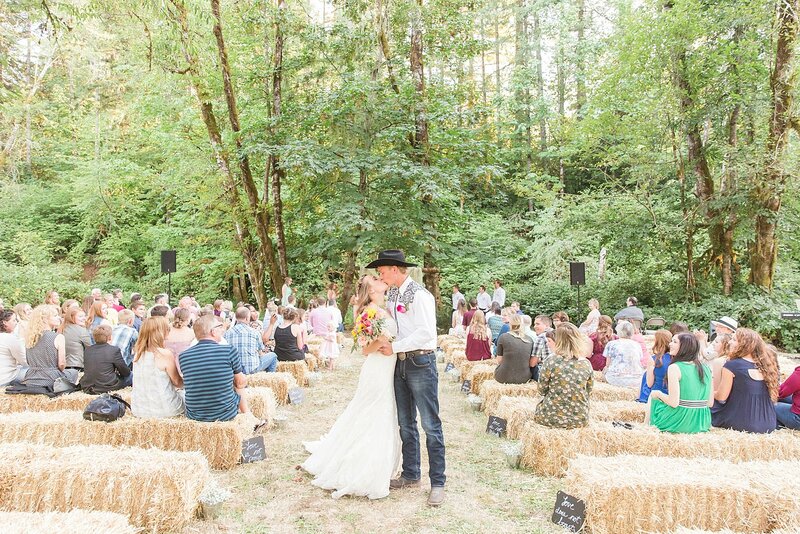 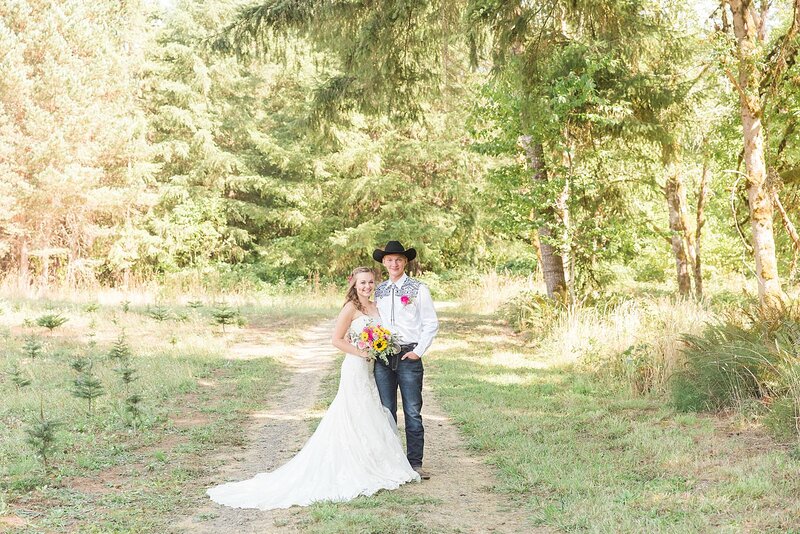 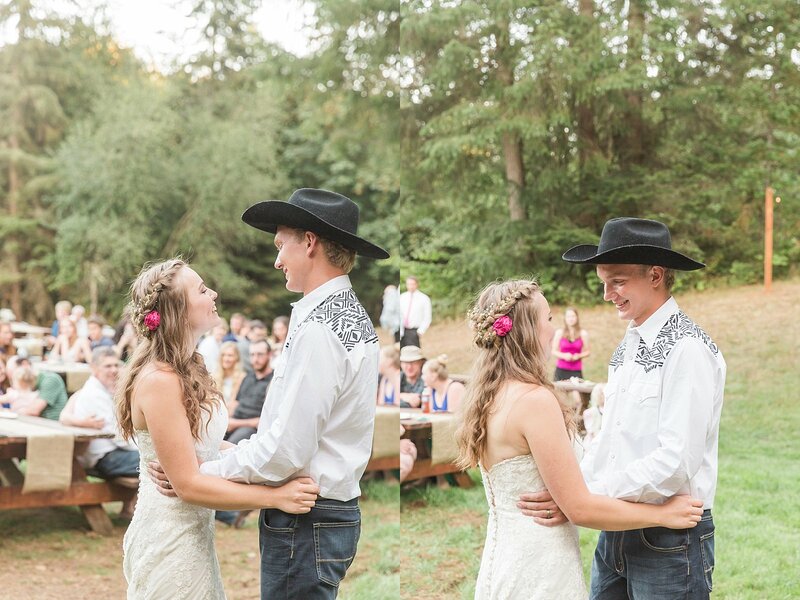 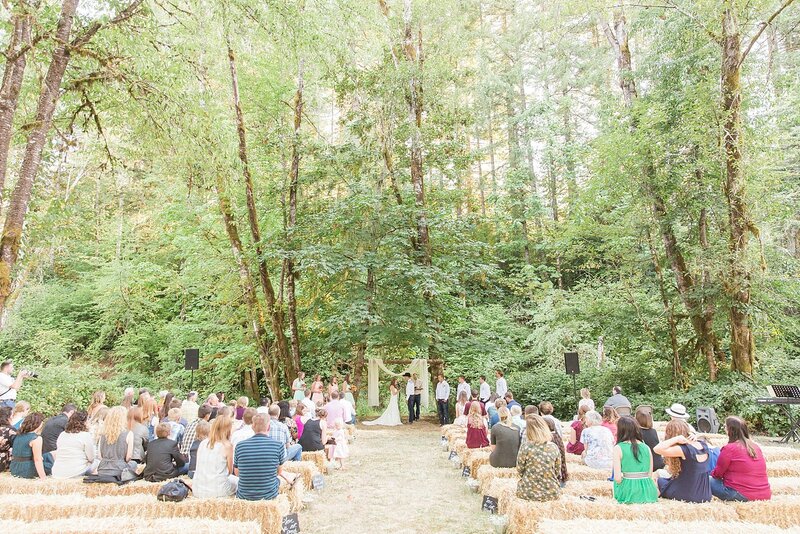 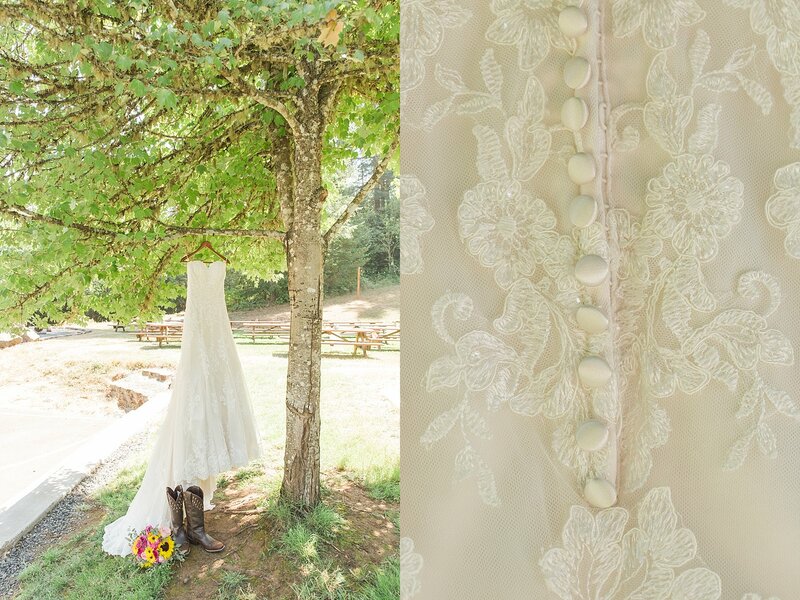 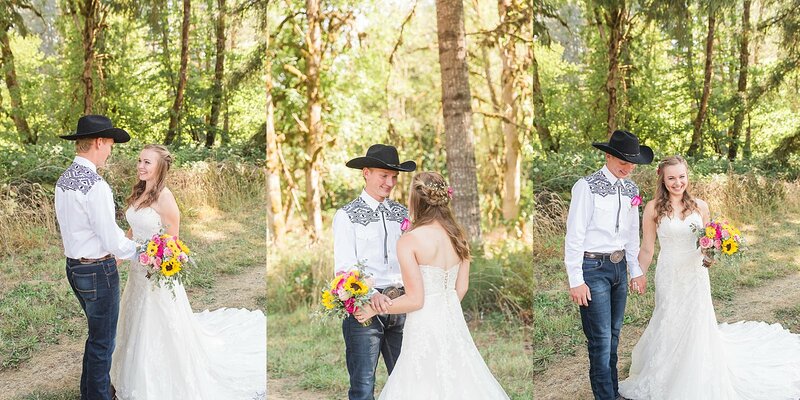 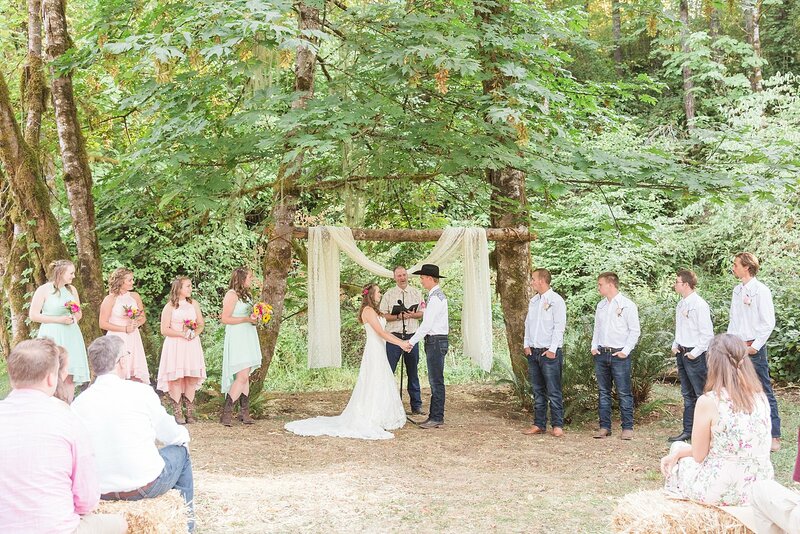 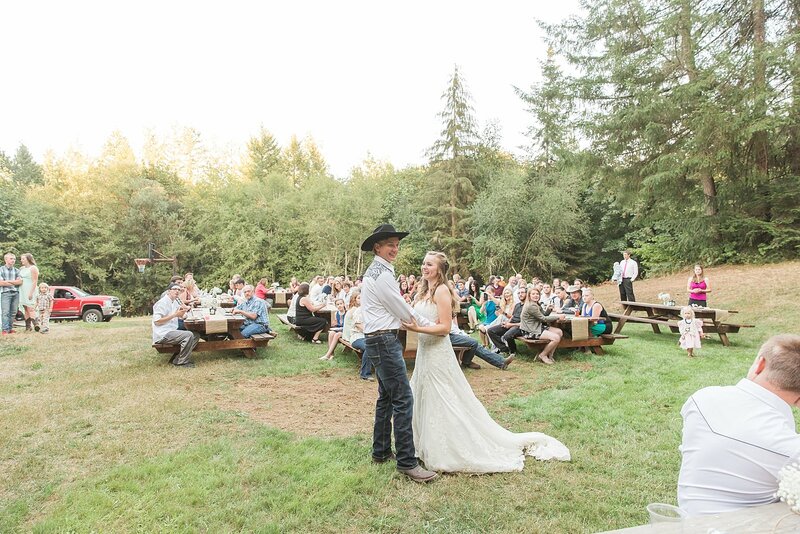 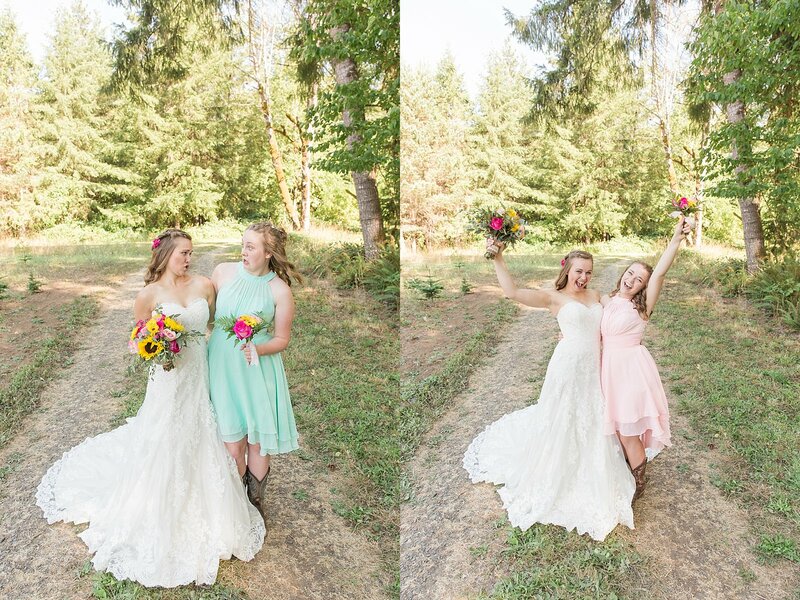 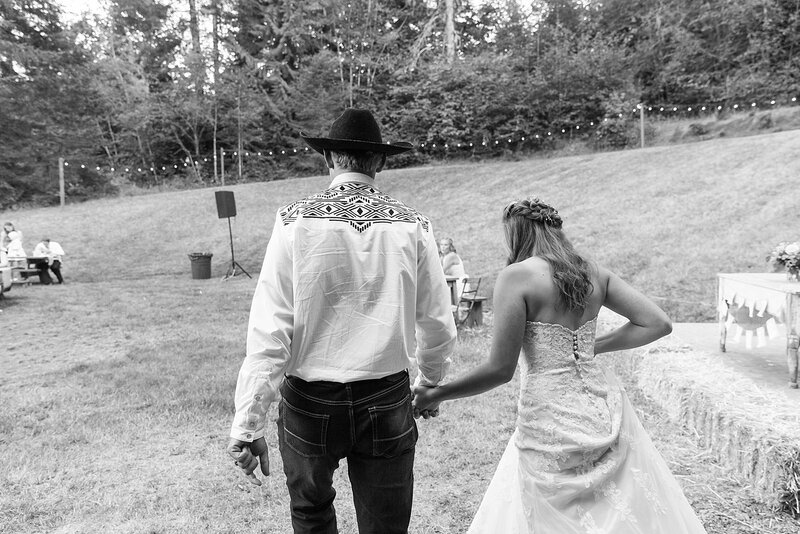 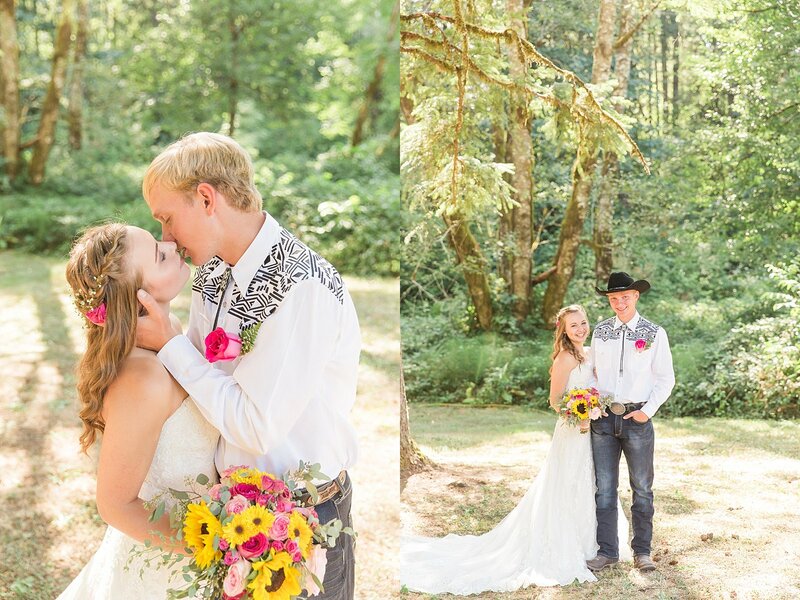 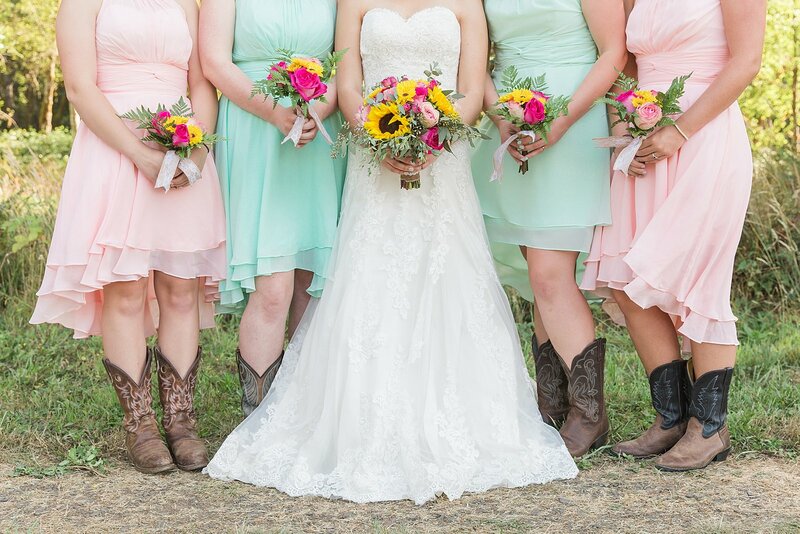 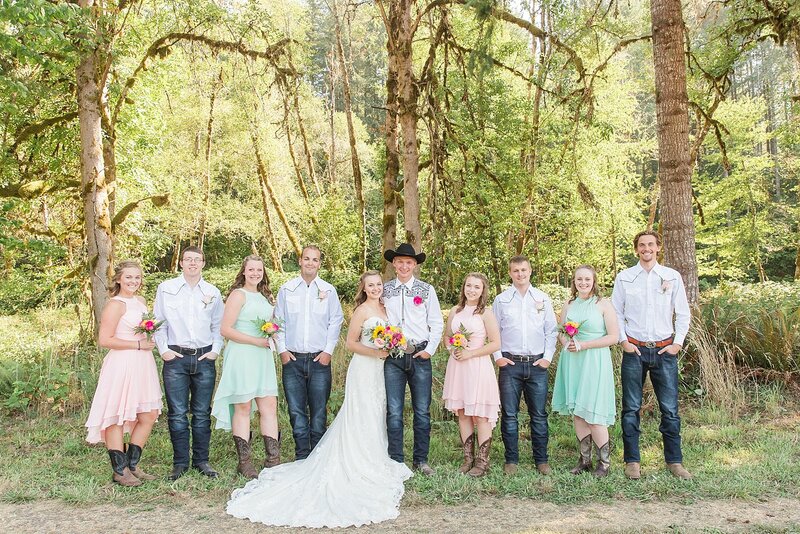 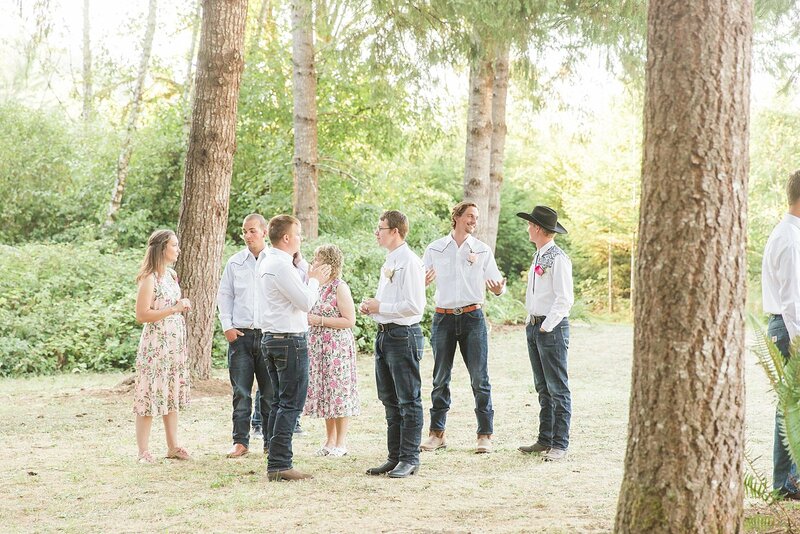 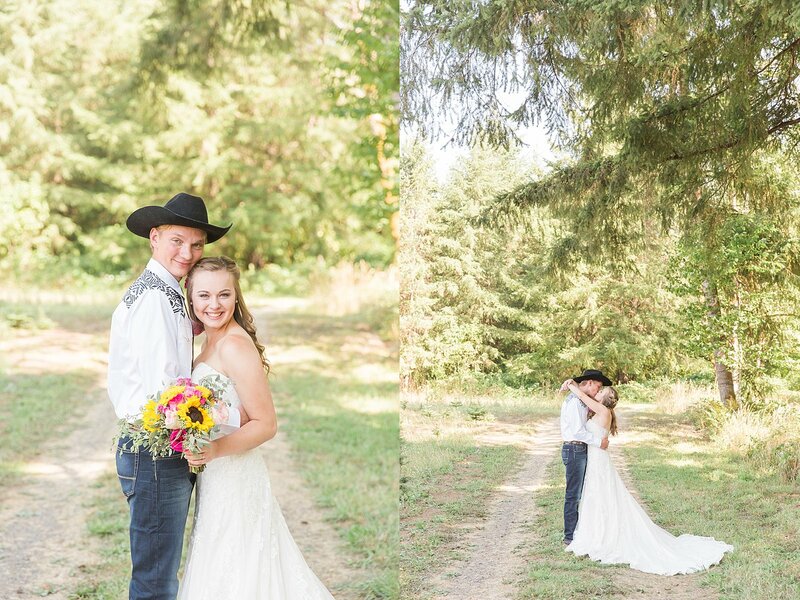 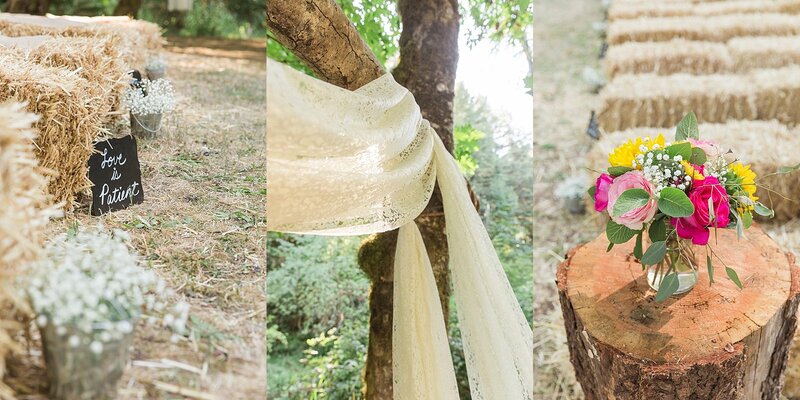 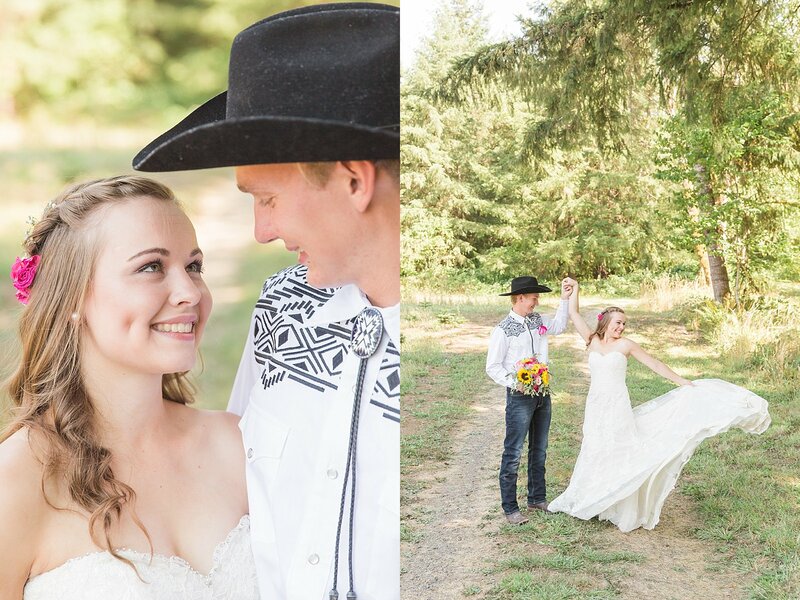 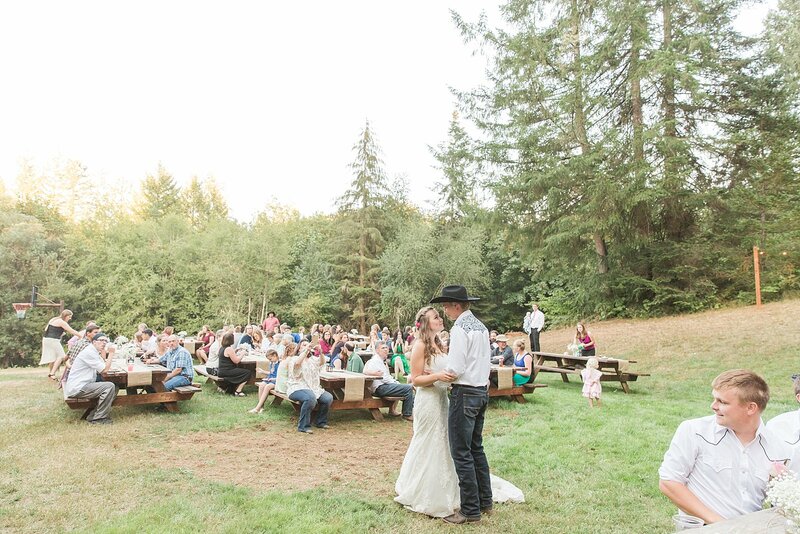 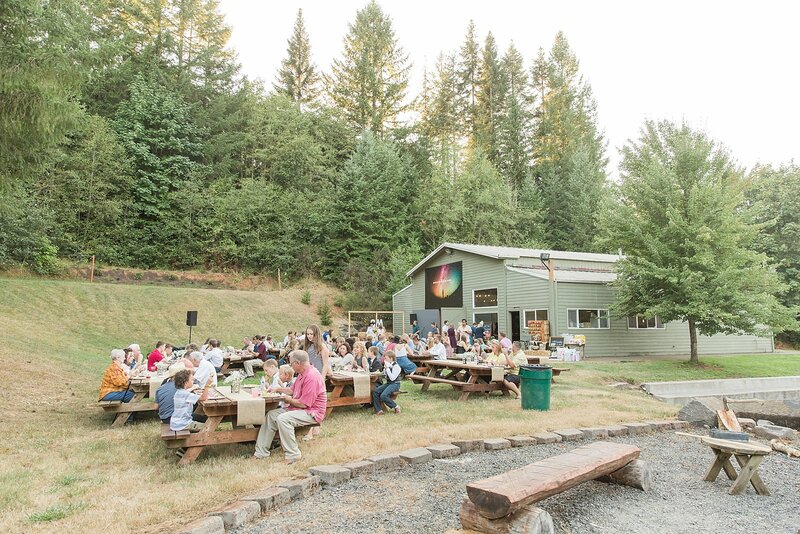 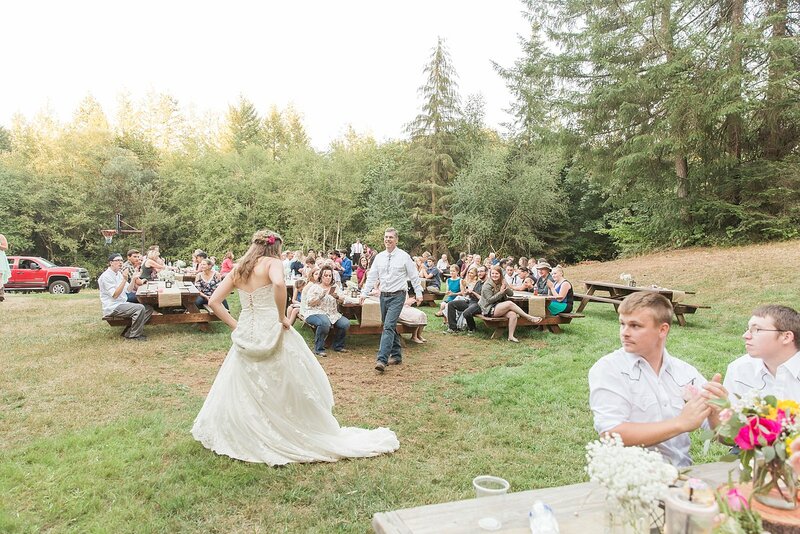 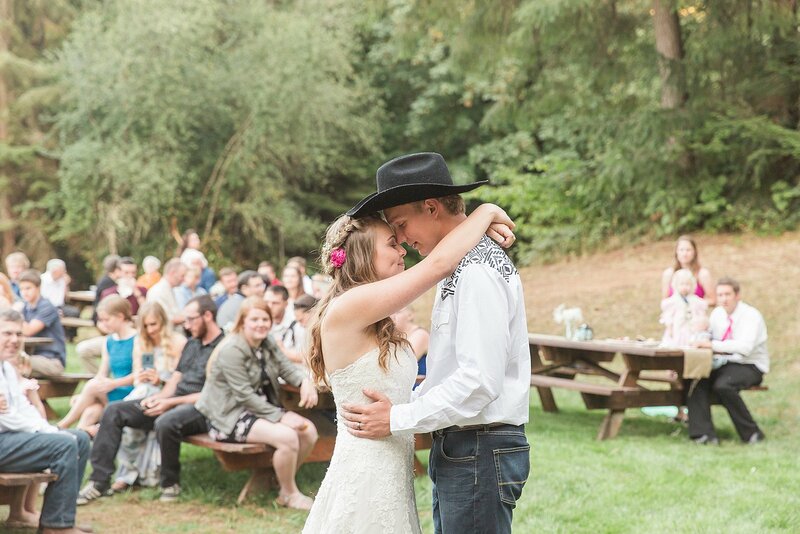 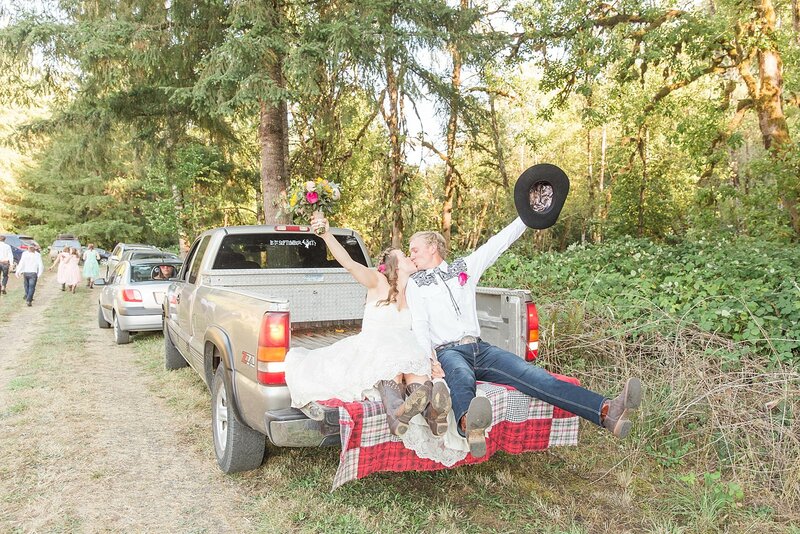 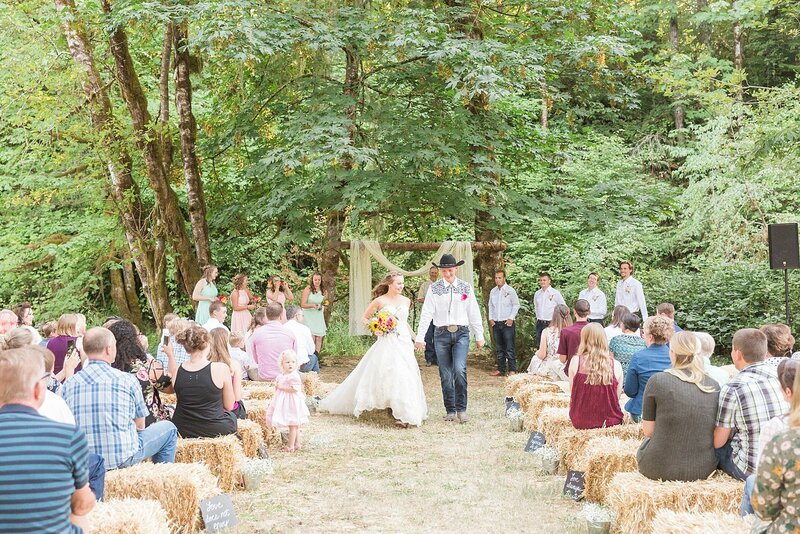 ), and they were married by Caleb’s dad under a canopy of trees, surrounded by their family and friends. 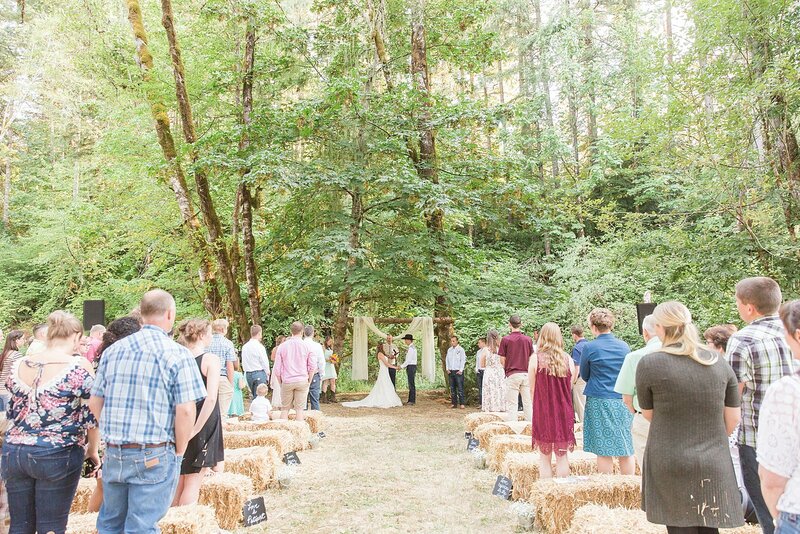 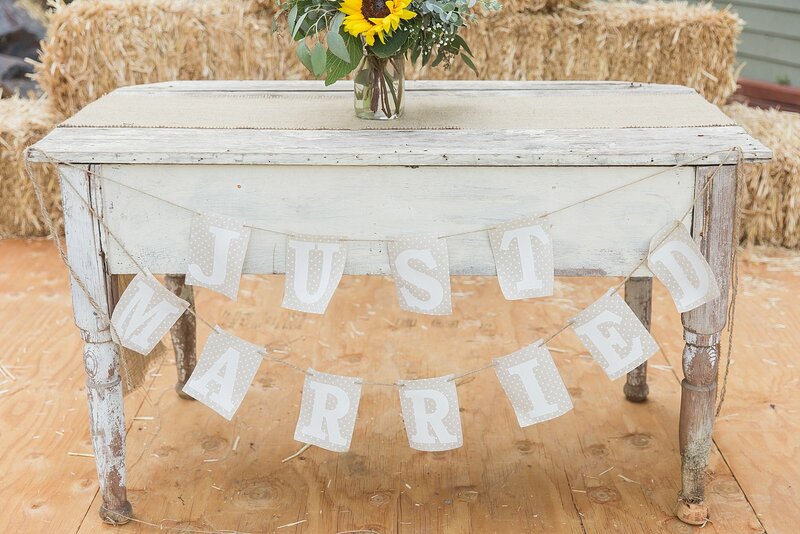 The ceremony was so sweet, God-honoring, and perfectly THEM, and then suddenly they were husband and wife and racing back up the aisle toward their new life together!! 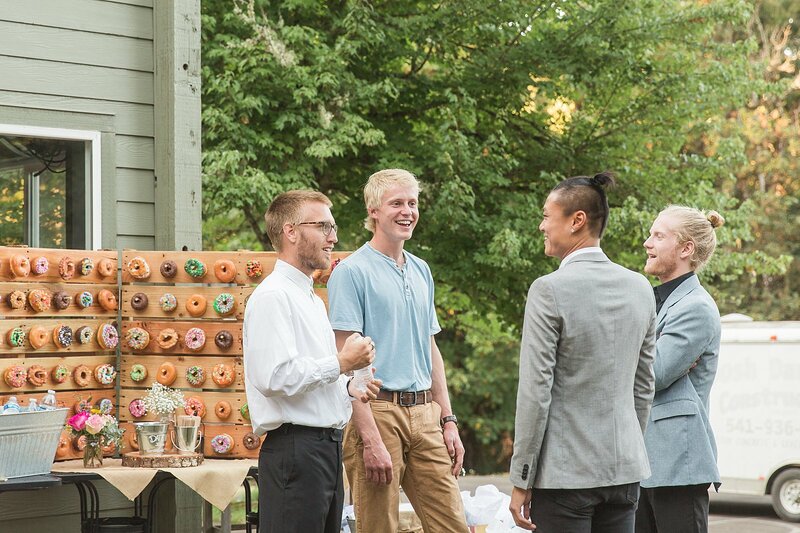 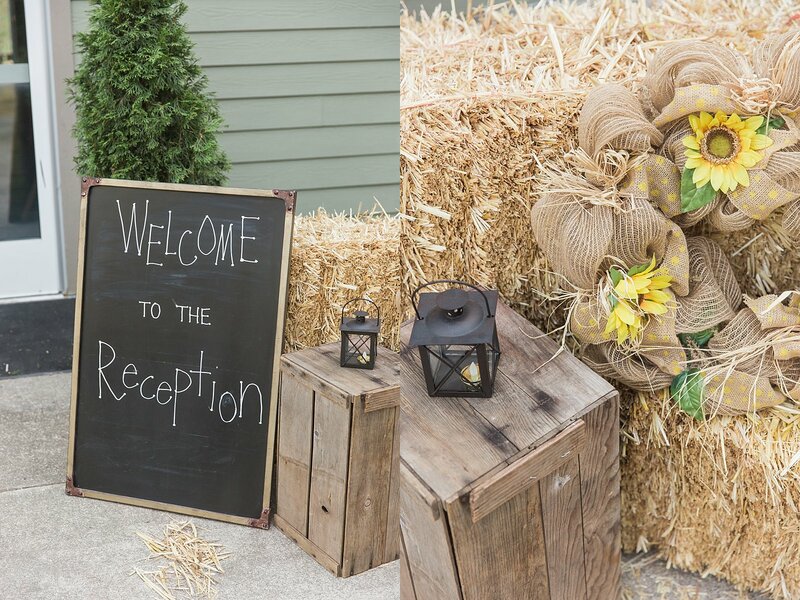 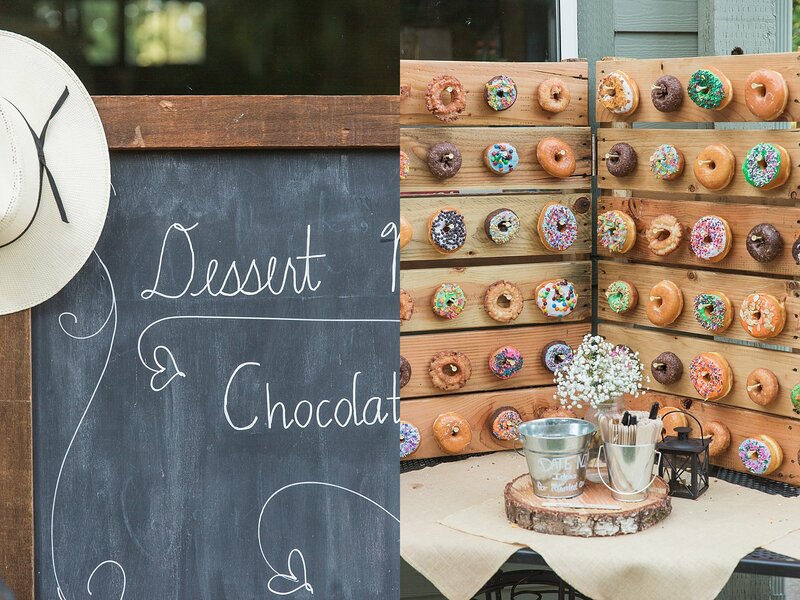 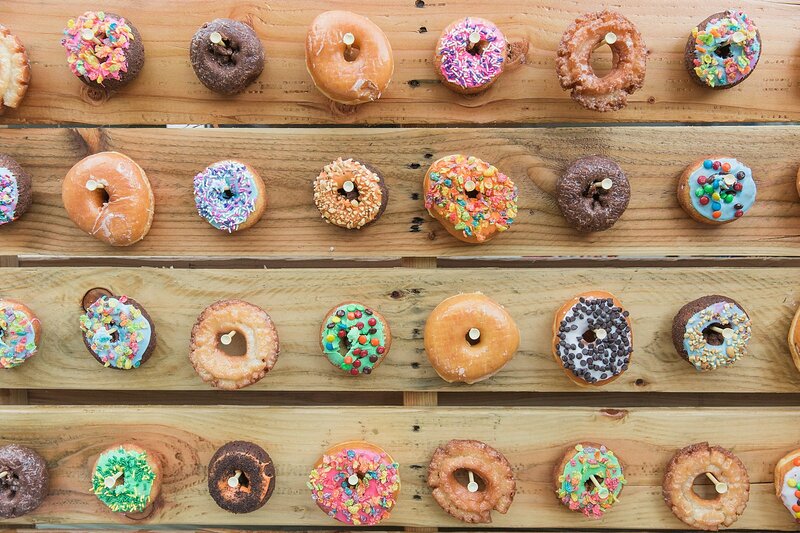 But before they completely ditched us all, they made a stop at their reception…which was a good thing since there was a chocolate fondue fountain and donut wall waiting for them!! 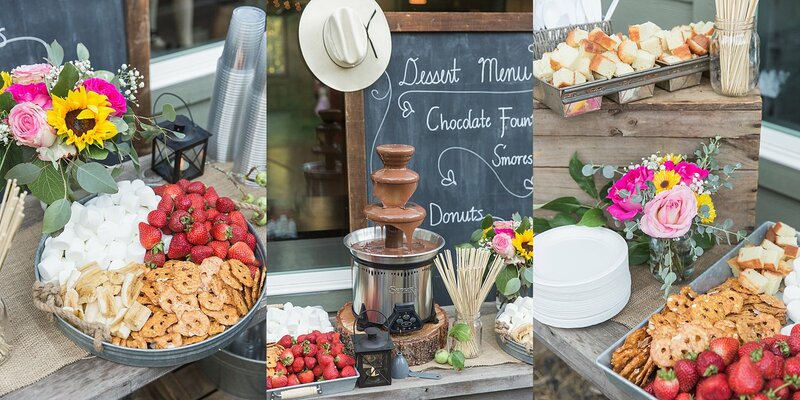 I generally don’t eat sugar, and prefer my chocolate around the 80-90% range, but even I couldn’t resist dipping a few bananas and strawberries in that cascading velvet chocolate. 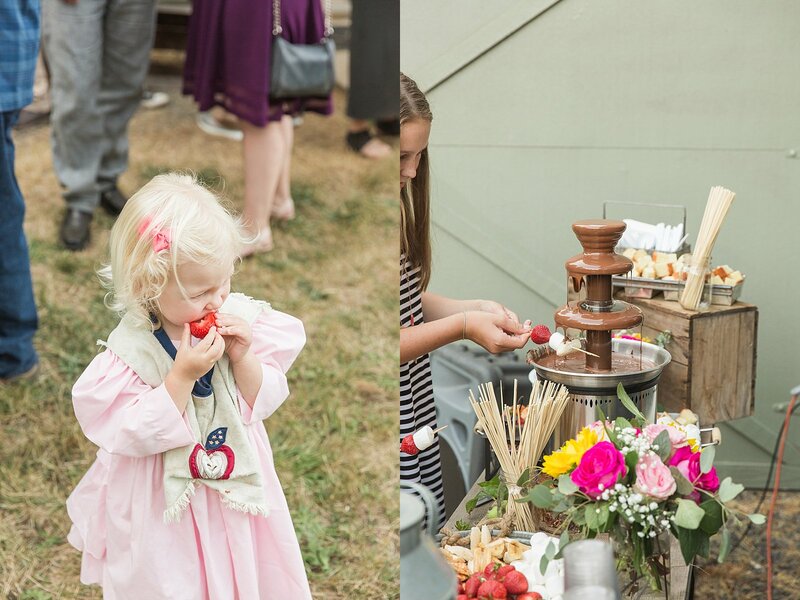 I think I am going to start offering a discount to couples who have chocolate fountains (or coffee carts!!) 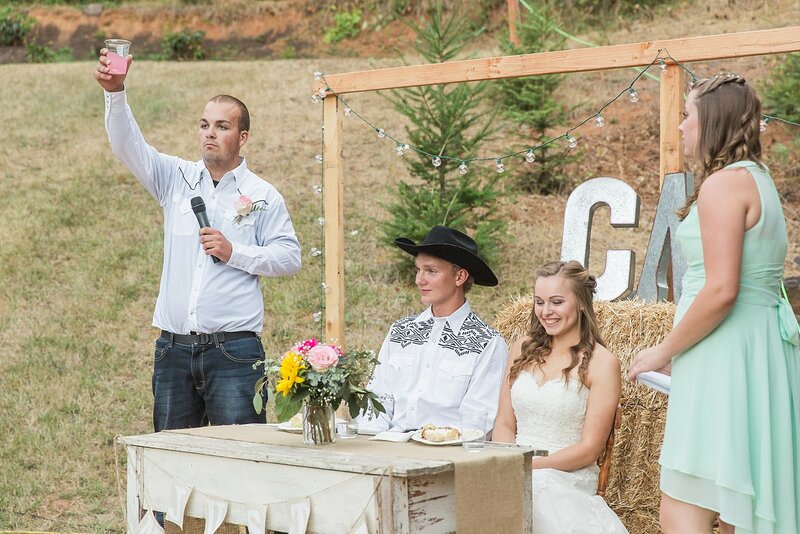 at their weddings. 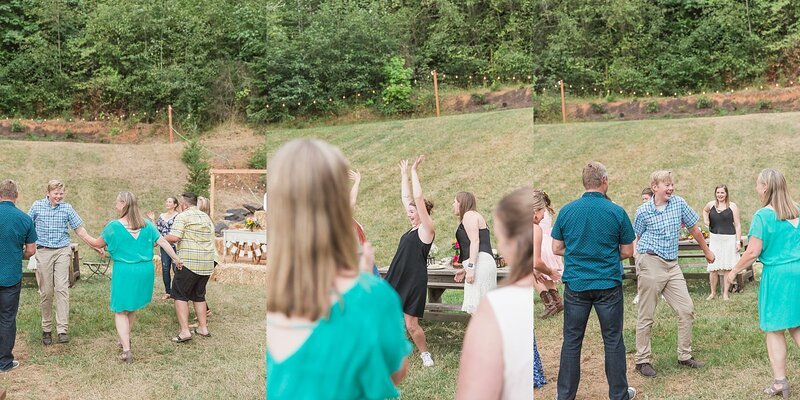 (Just kidding. 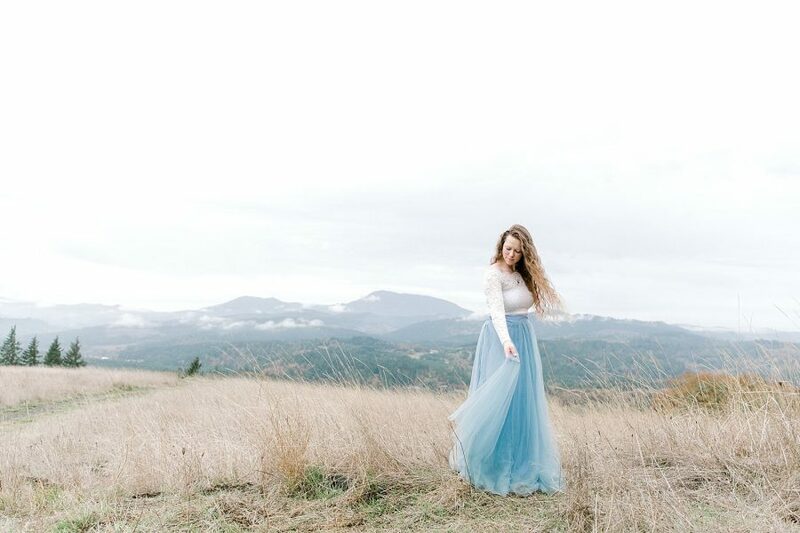 Sorta.) 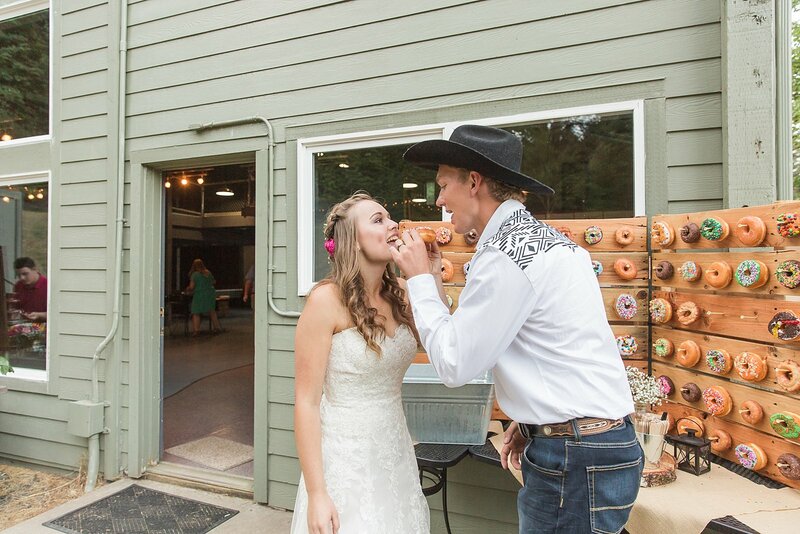 After dinner, speeches, and the newlyweds sharing a donut together, it was onto the dance floor for Caleb + Madalyn’s first dance. 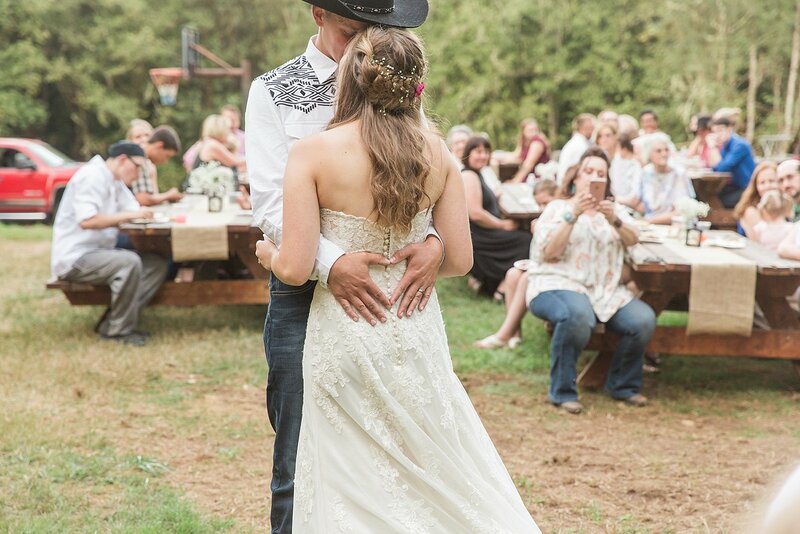 I love watching couples interact during their first dance…smiles, laughs, heads resting on shoulders, tears, singing the words to each other…emotions often run the full gamut, and I always feel that this is one of the moments that it really sinks in for a couple that they are finally married. 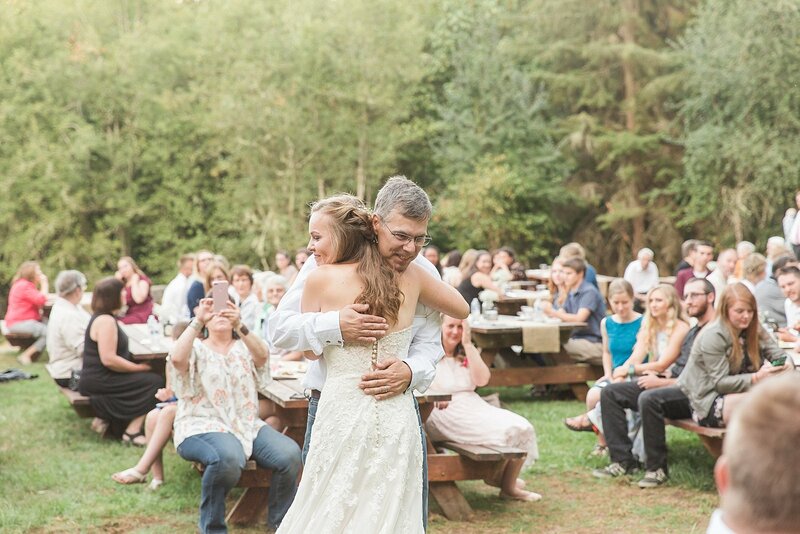 After the newlyweds first dance, it was time for the Daddy-Daughter dance which (without fail) makes me cry every single time. 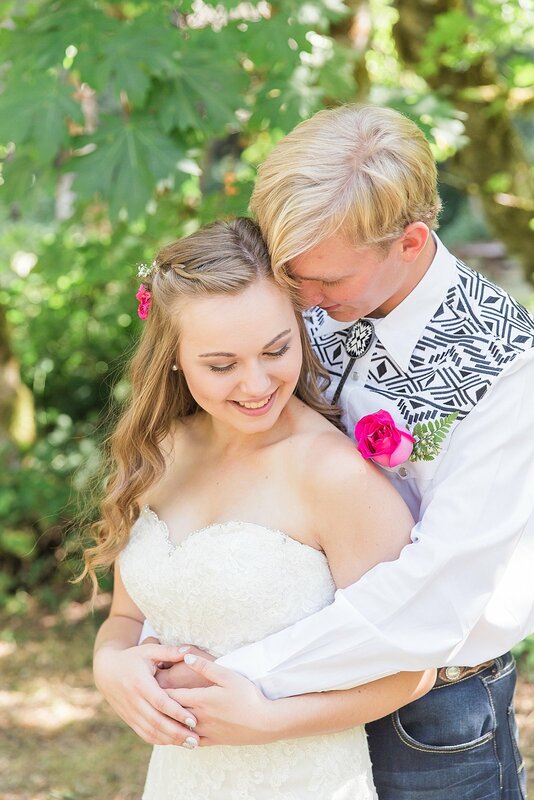 (I’m serious. 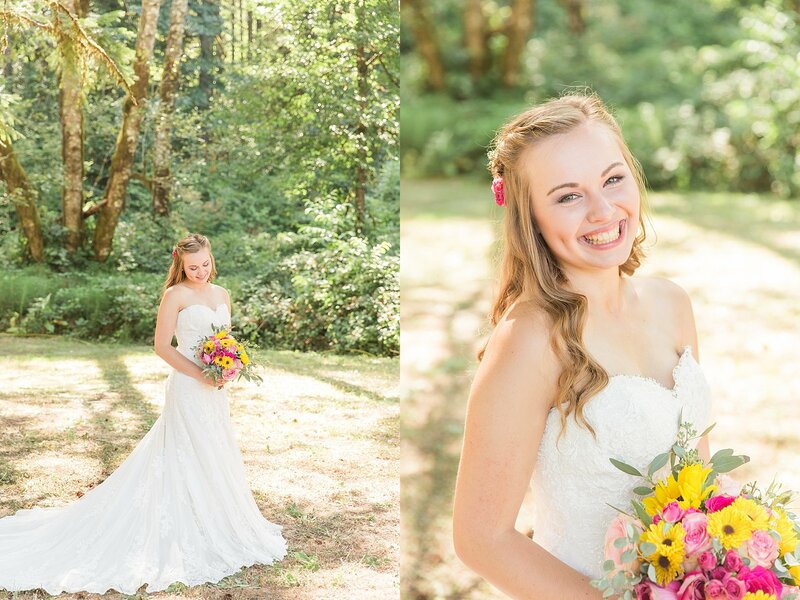 If you don’t want a photographer who will have happy tears in her eyes multiple times during the day, then don’t hire me.) 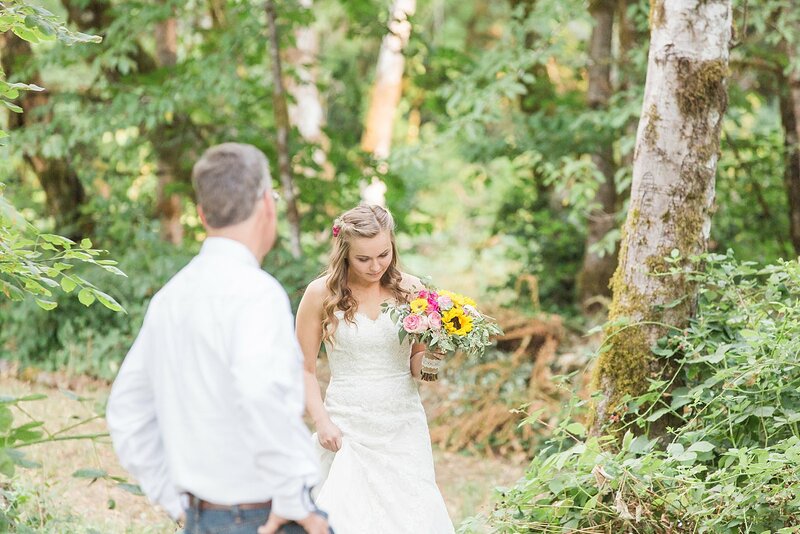 Madalyn and her dad were so sweet together, and I loved watching both them and the way Madalyn’s mom looked at her husband and daughter. 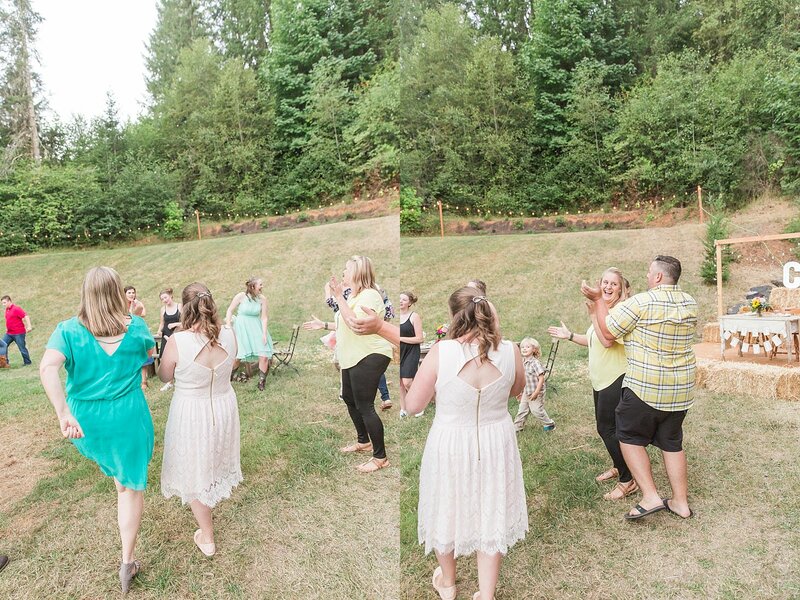 More lively dancing followed those two first dances, and then it was time for sunset husband + wife photos. 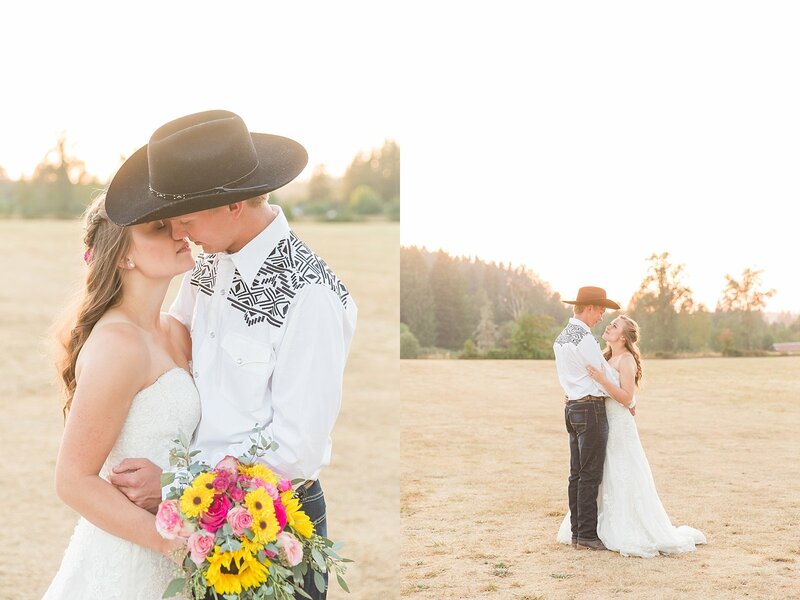 Can we just take a moment to talk about sunset photos and why they are so wonderful? 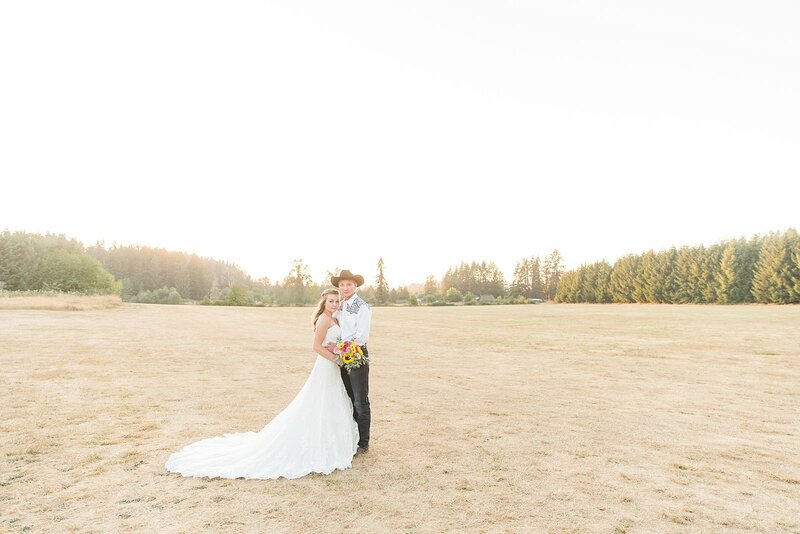 First off, it’s the most beautiful time of the day. 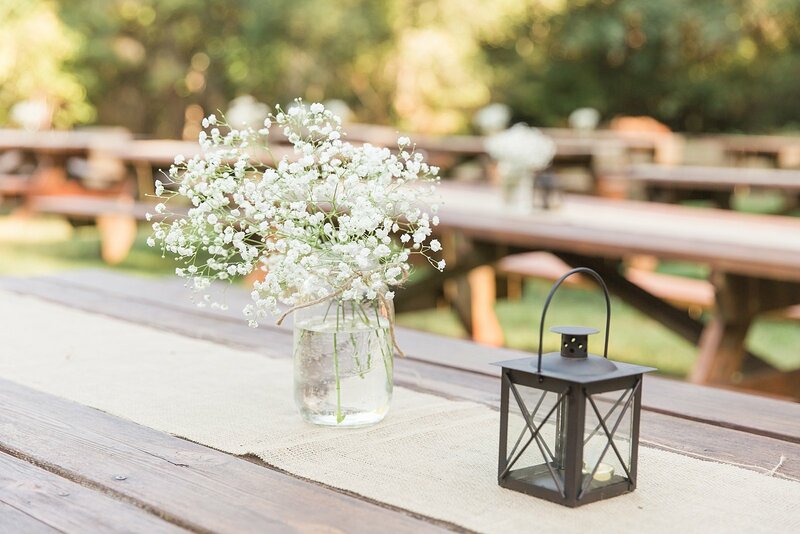 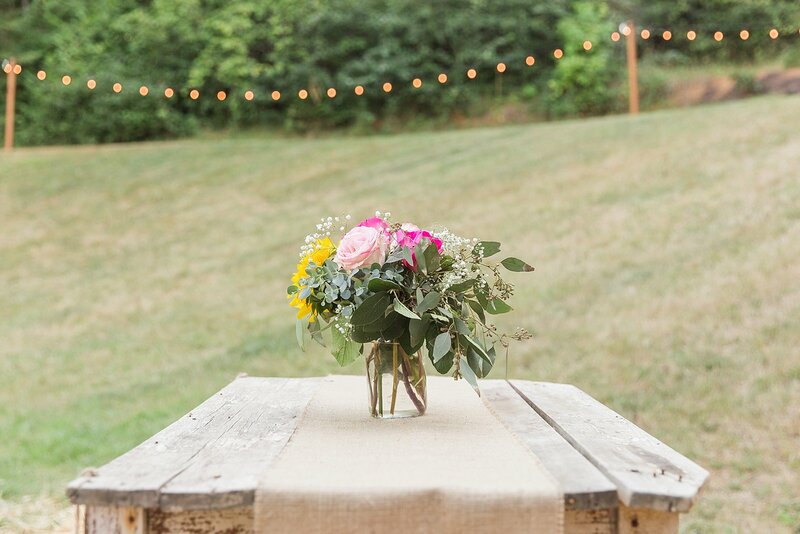 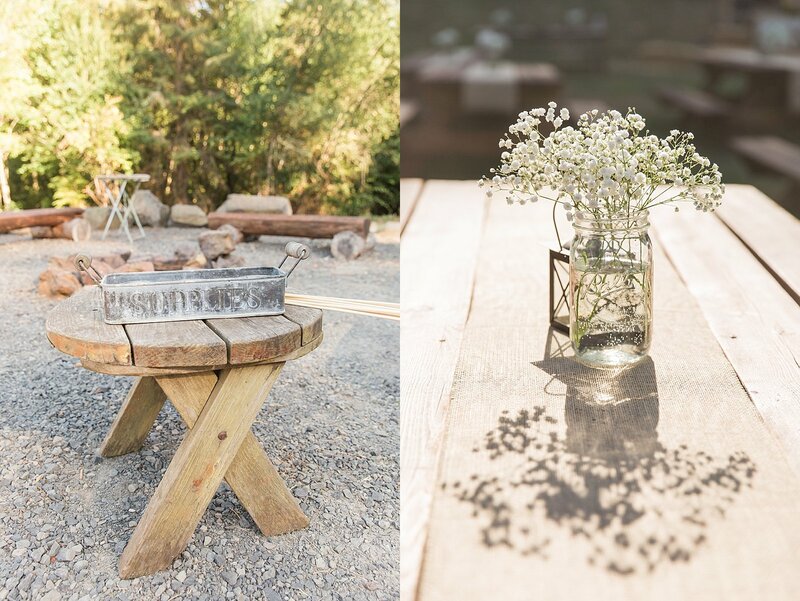 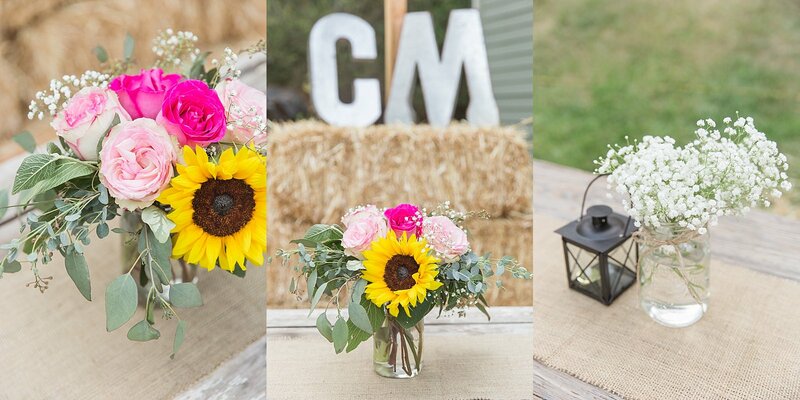 You’ve got that soft, golden light casting a romantic glow on everything, which I mean come on, who doesn’t want a romantic glow on their wedding day?! 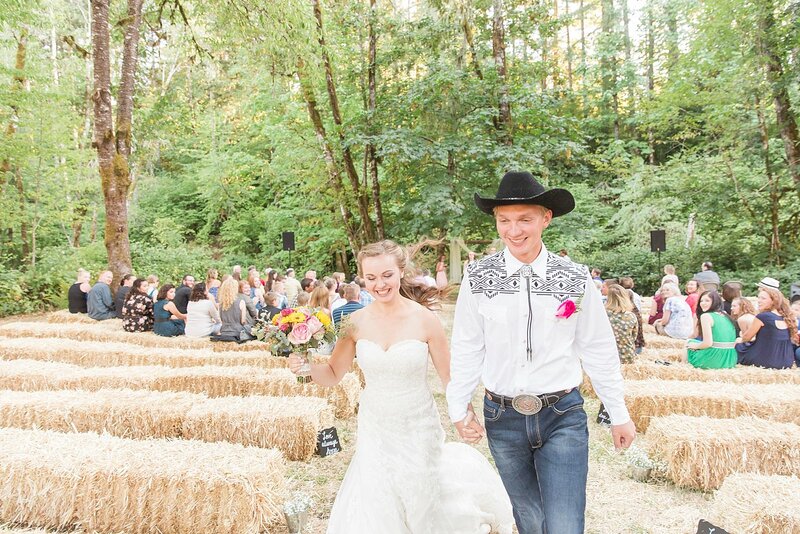 Then of course there’s the fact that you’re finally husband and wife! 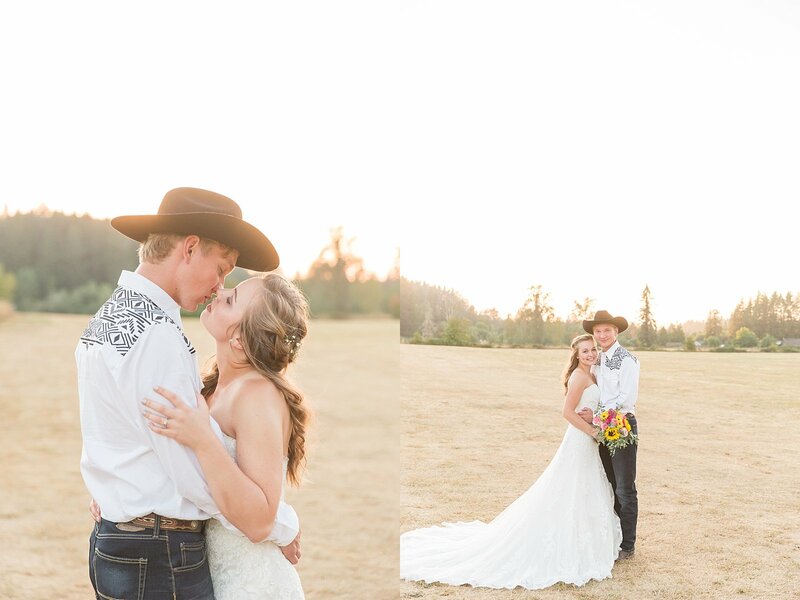 Generally, it’s just me and the Bride + Groom for sunset photos, which allows them to relax into each other, breathe in the moments, and really soak up the fact that they are finally married, all while I am over there just photographing away. 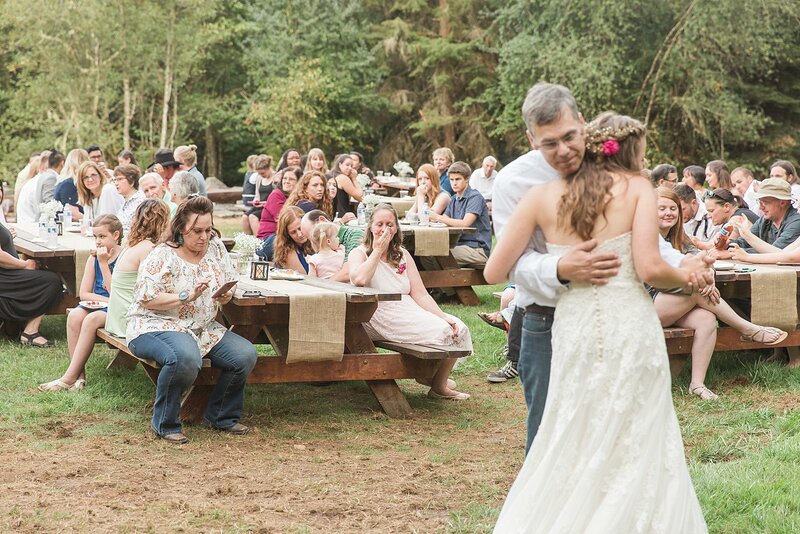 All of this means that you get some of the most romantic images of the entire day, all without the stress of a strict timeline and hustling to get to the next set of portraits. 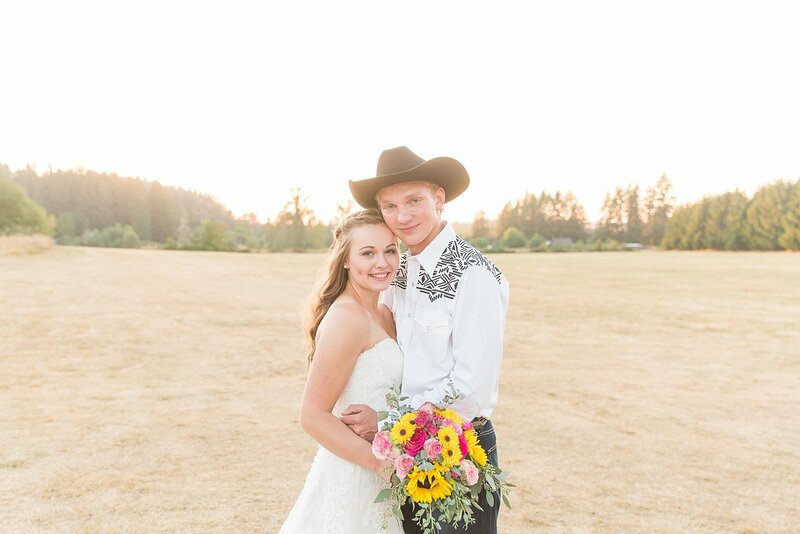 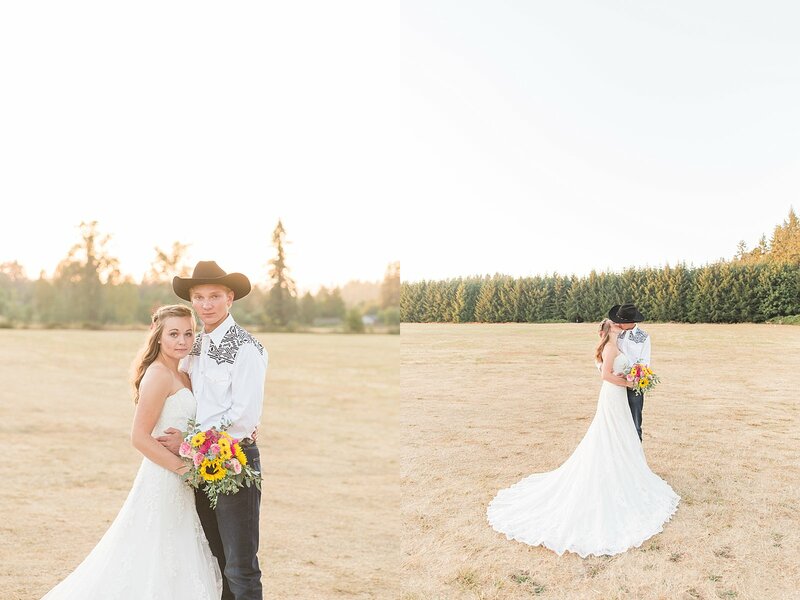 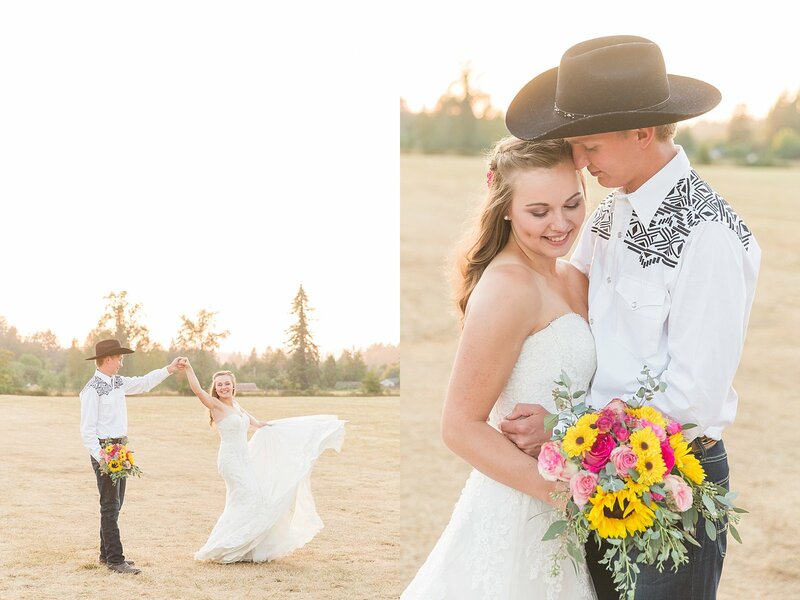 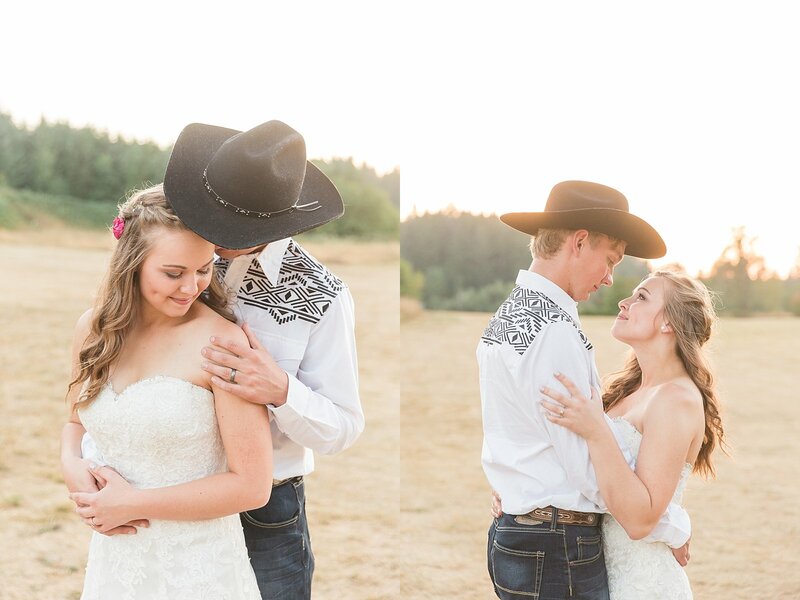 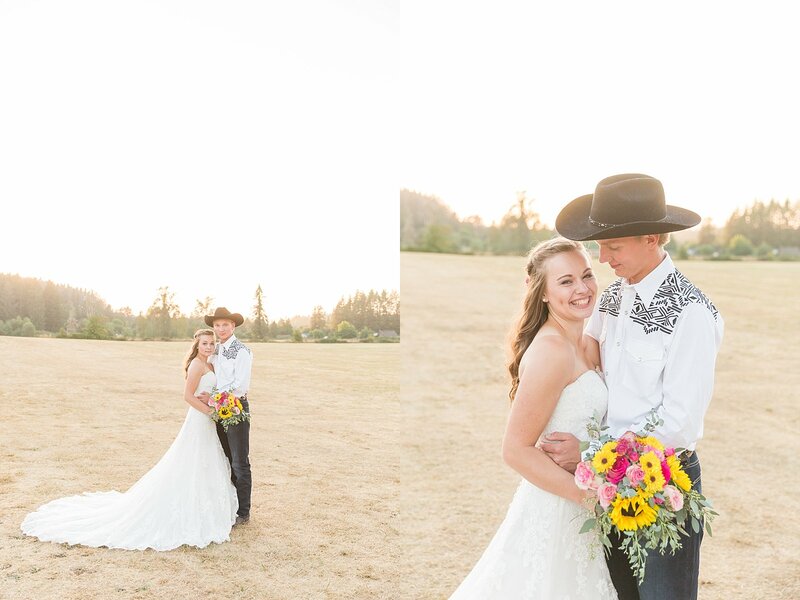 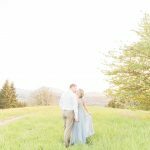 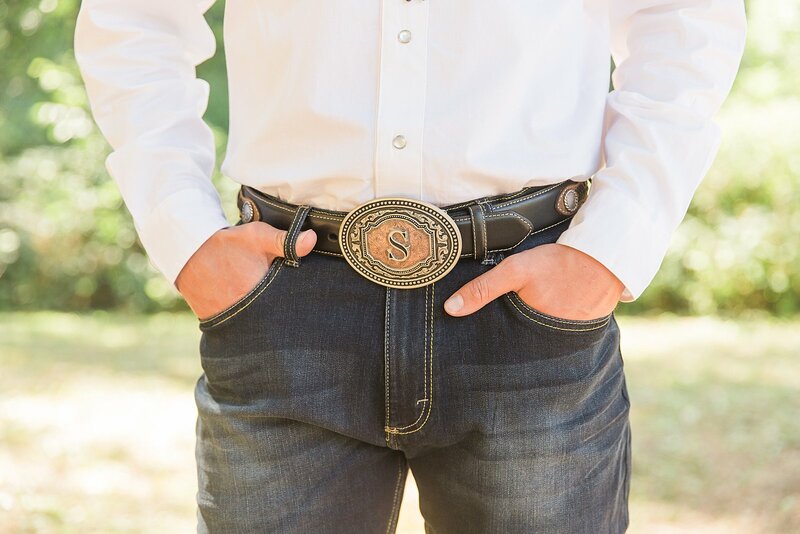 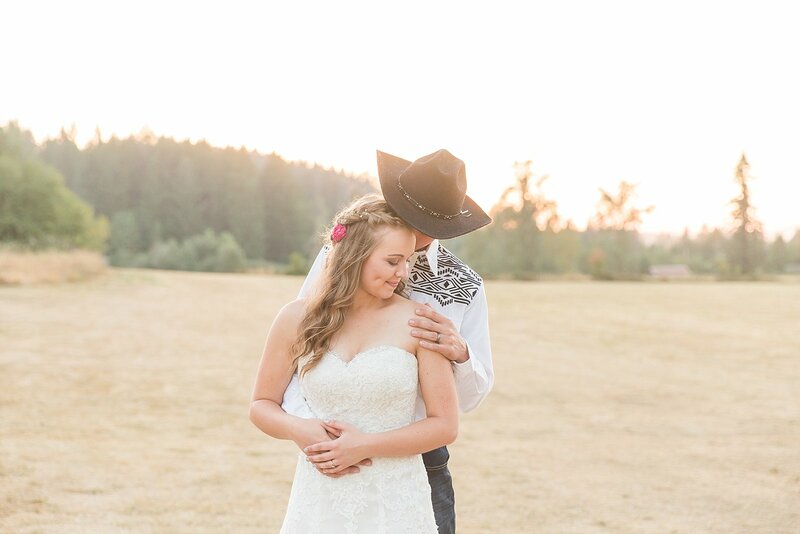 So, suffice to say, I am a fan of sunset husband and wife photos, and if you aren’t convinced by now, well just go ahead and scroll down the page because I just about guarantee you will be convinced after seeing Caleb + Madalyn’s!! 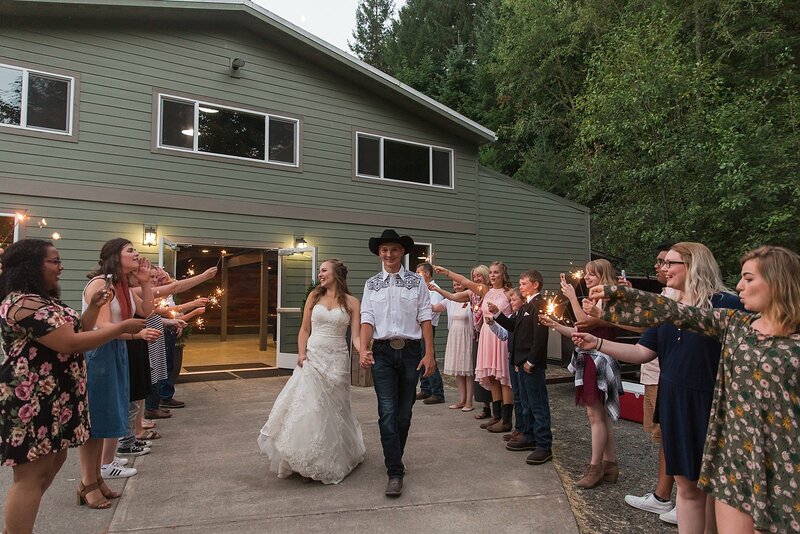 Soon after we got back from sunset portraits, the newlyweds were sent off to their honeymoon in an array of sparklers and well wishes. 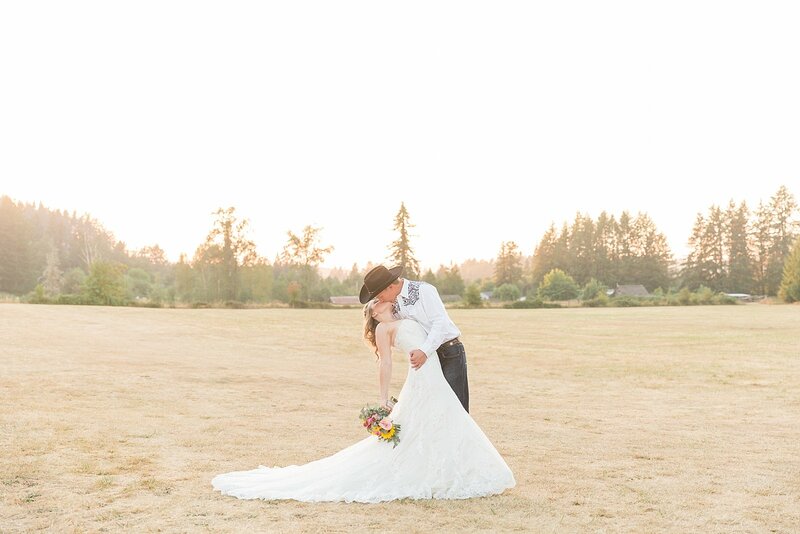 Definitely a good ending to a wonderful day! 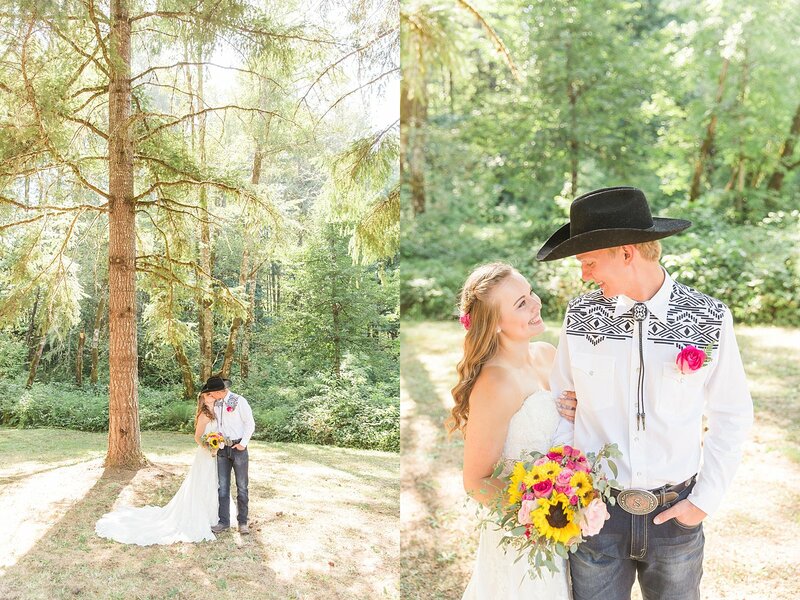 Caleb + Madalyn, your day was beyond spectacular, and I am forever thankful I got to capture it. 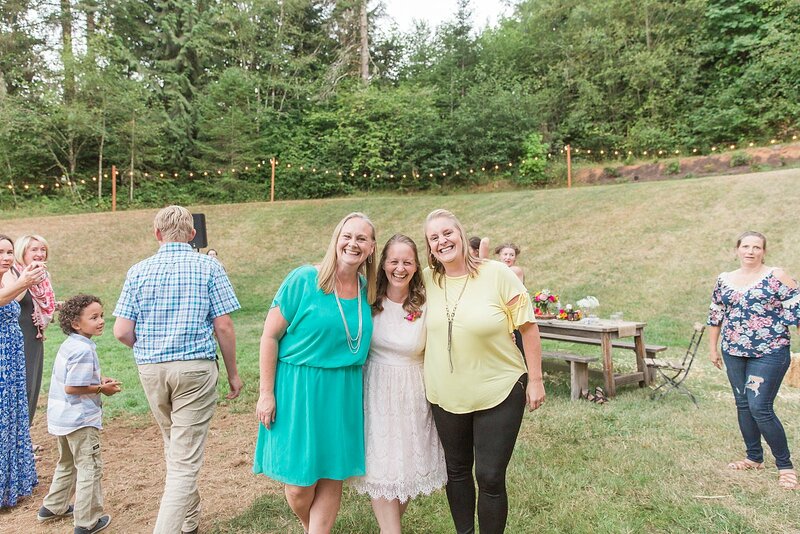 Maddy, you’ve been such a dear + sweet friend to me, and I am going to miss you tremendously! 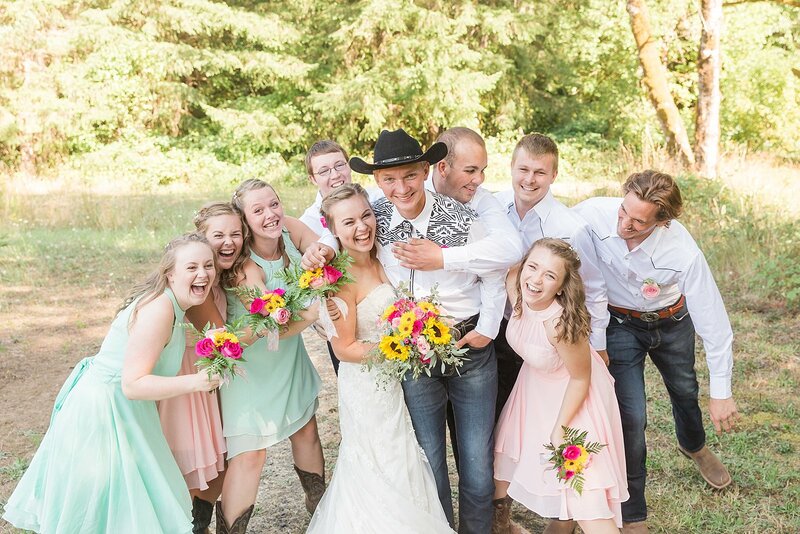 But I am so, so excited for this new adventure you are embarking upon, and cannot wait to come visit you guys! 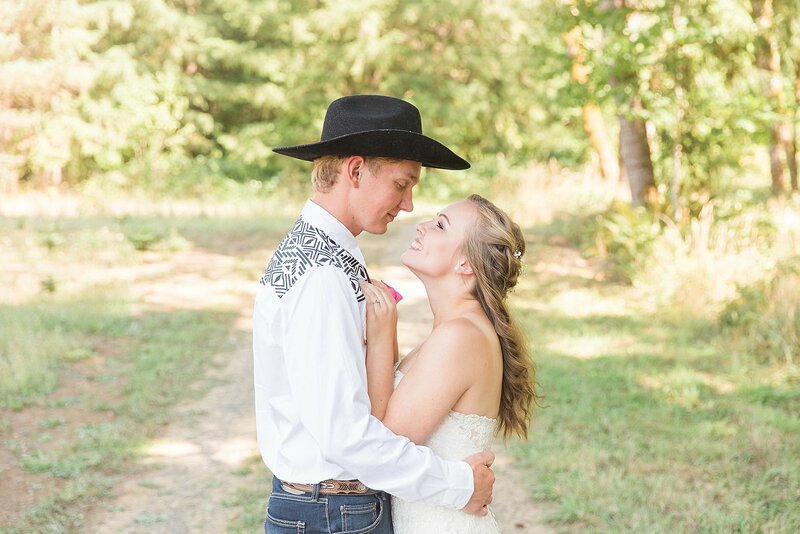 Caleb, I may not know you well, but I do know that you are the perfect fit for our Maddy. 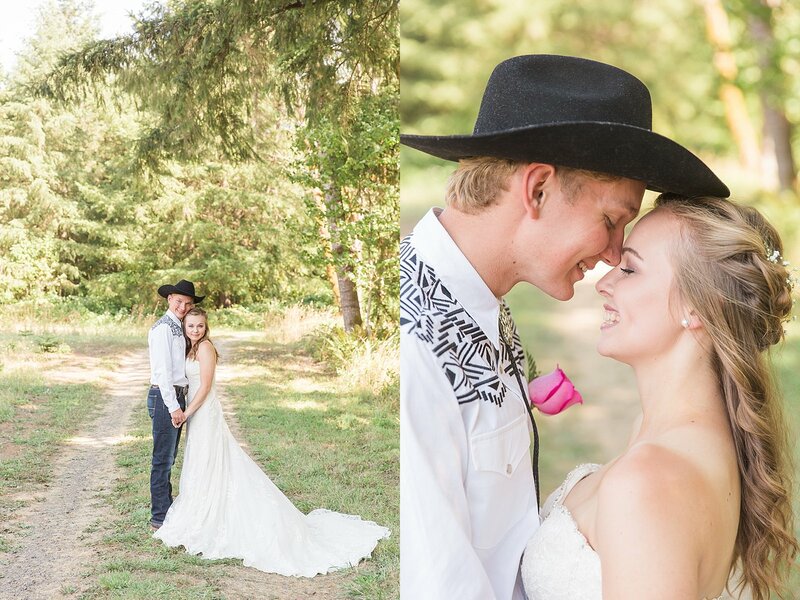 I wish you both the absolute best, and am praying God’s richest blessings for you and your new life together!